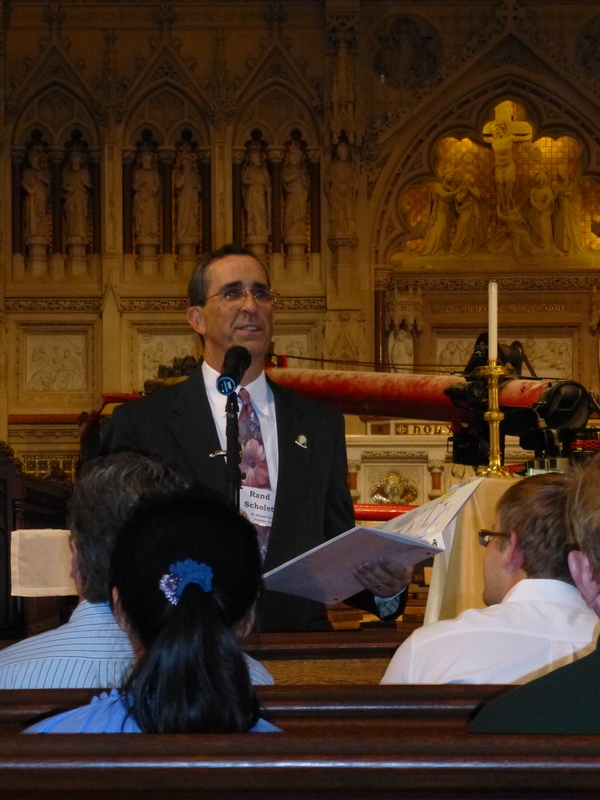 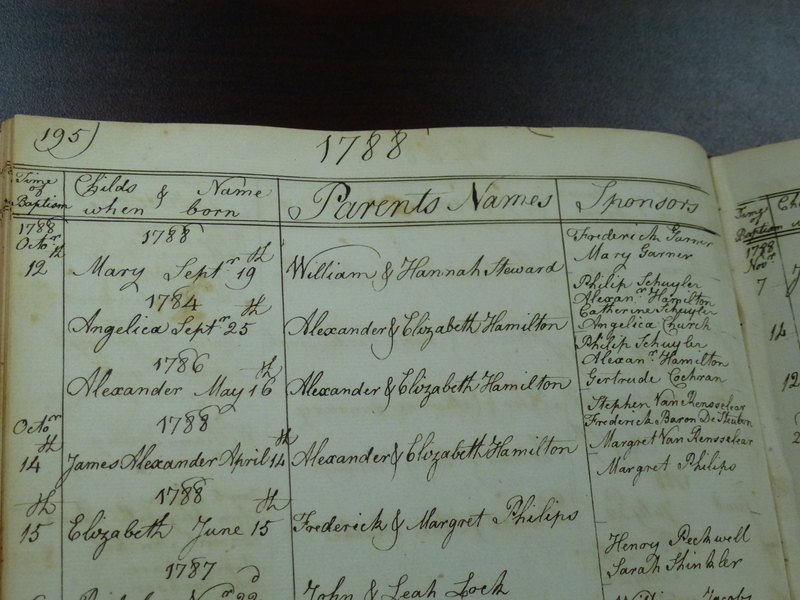 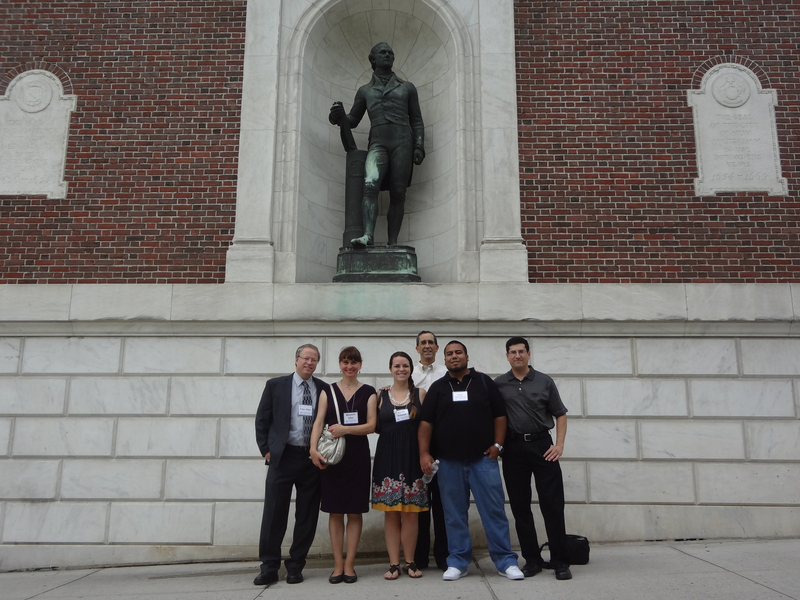 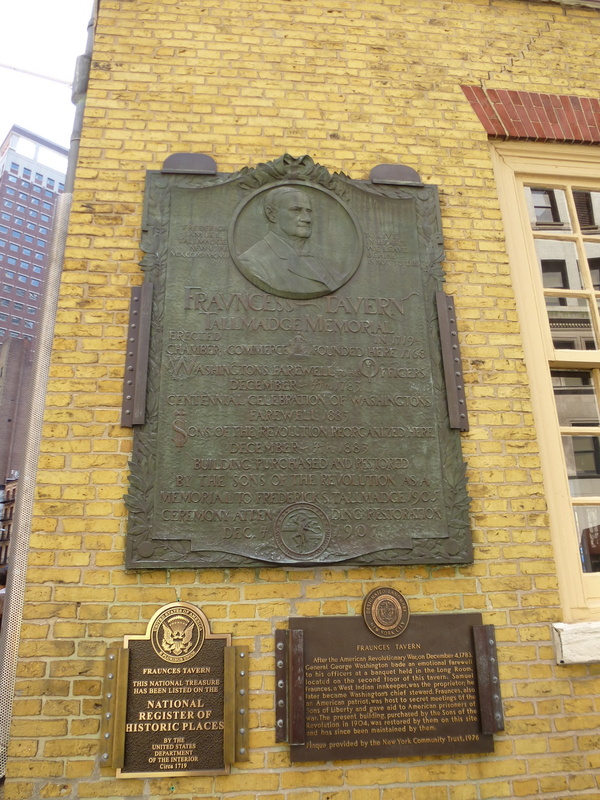 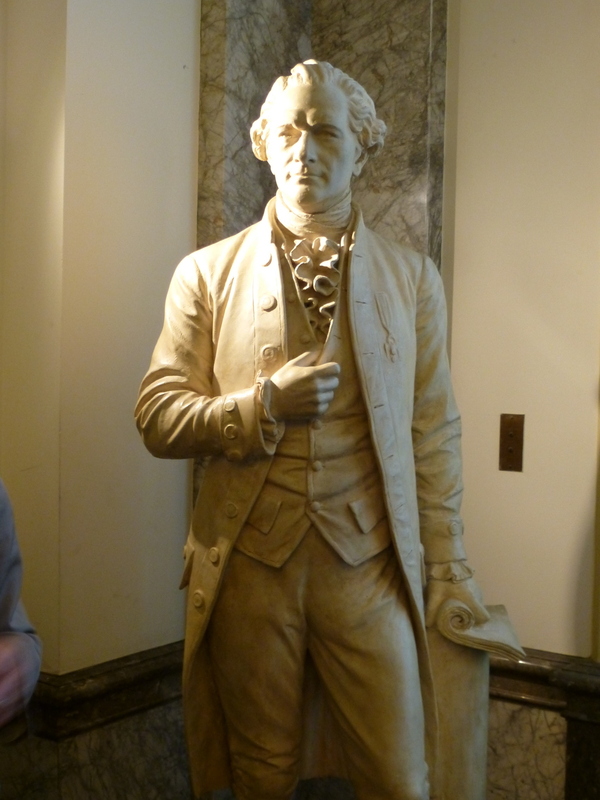 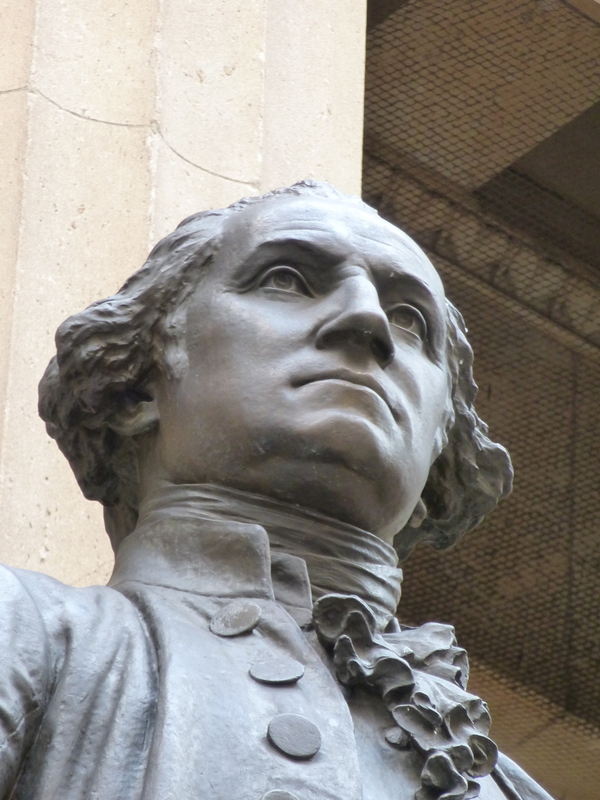 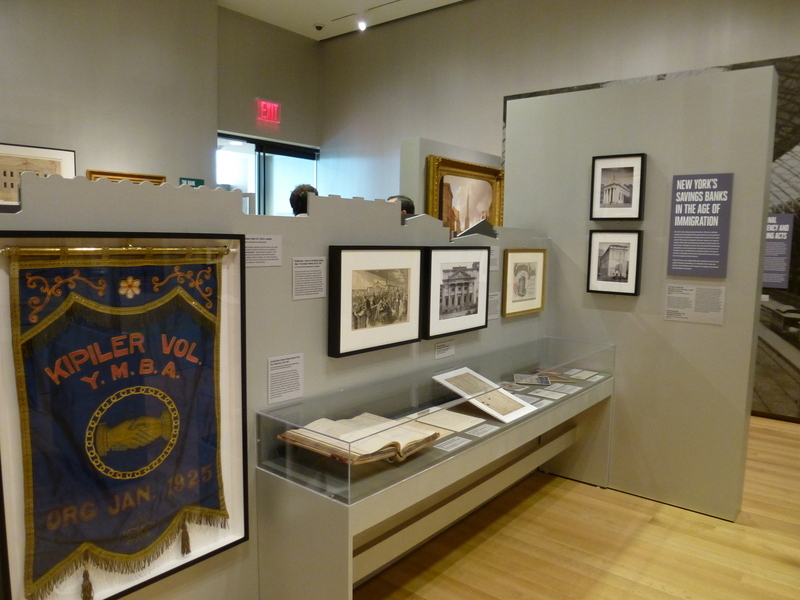 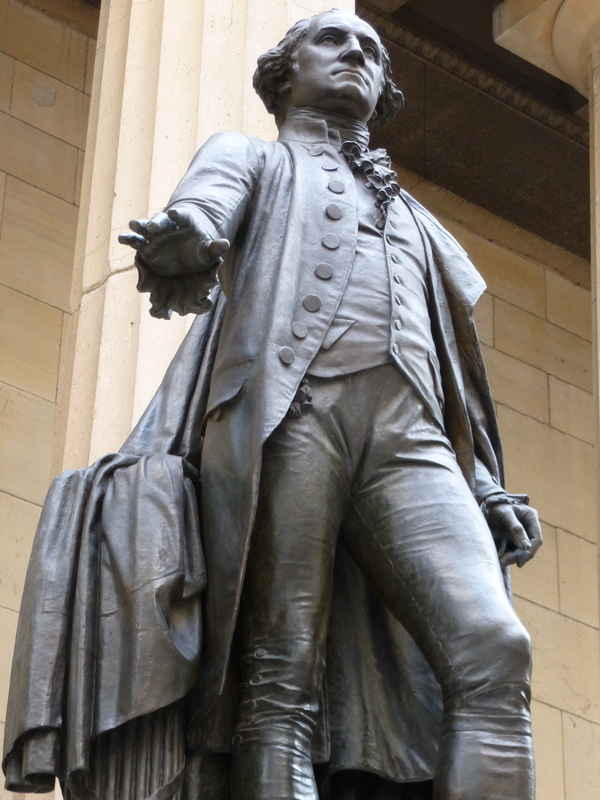 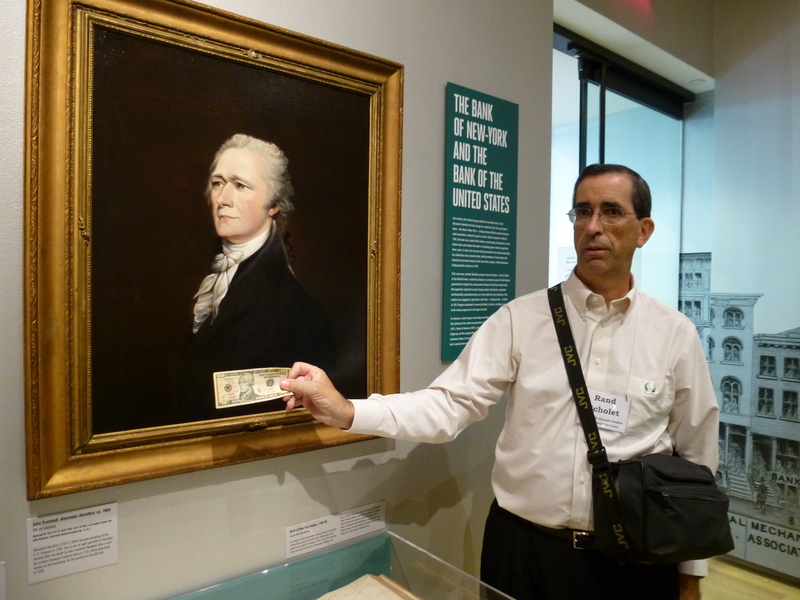 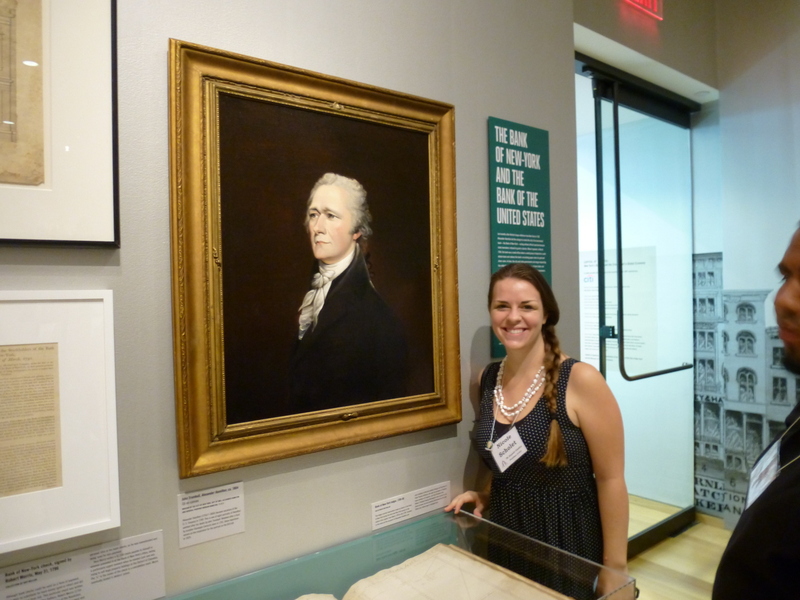 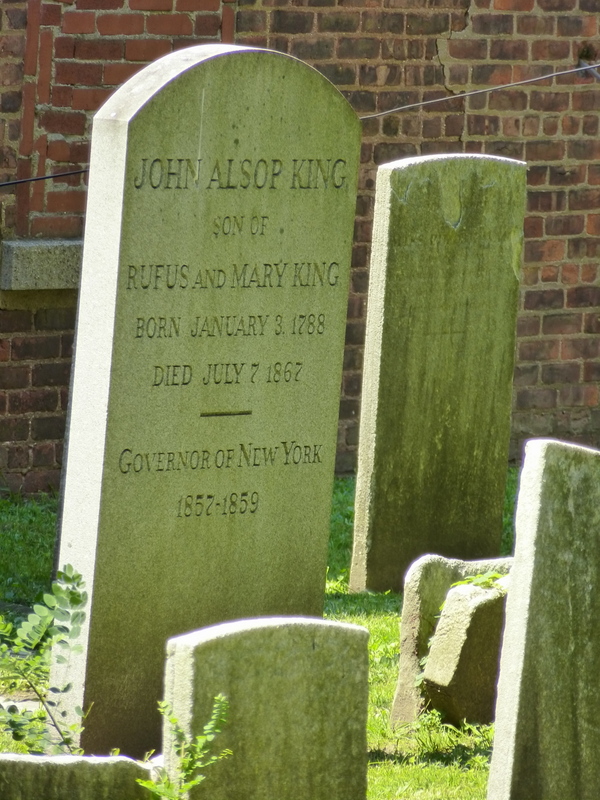 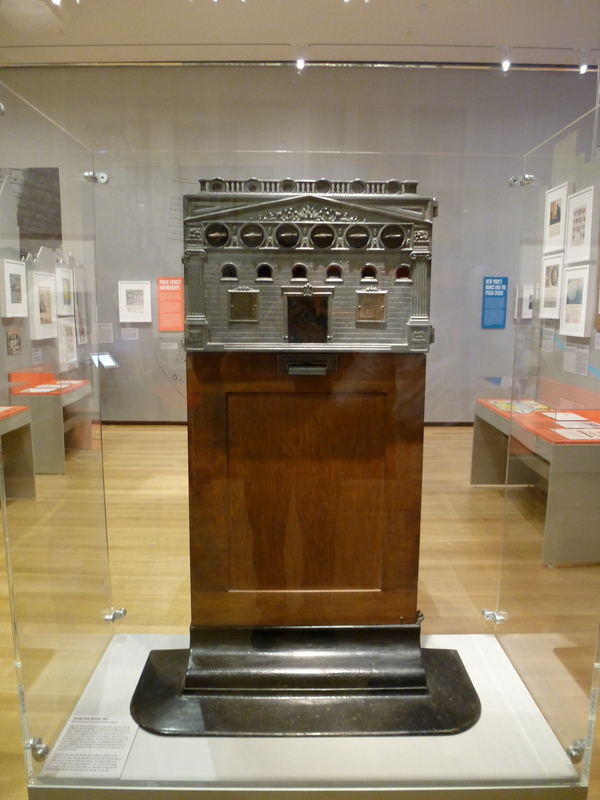 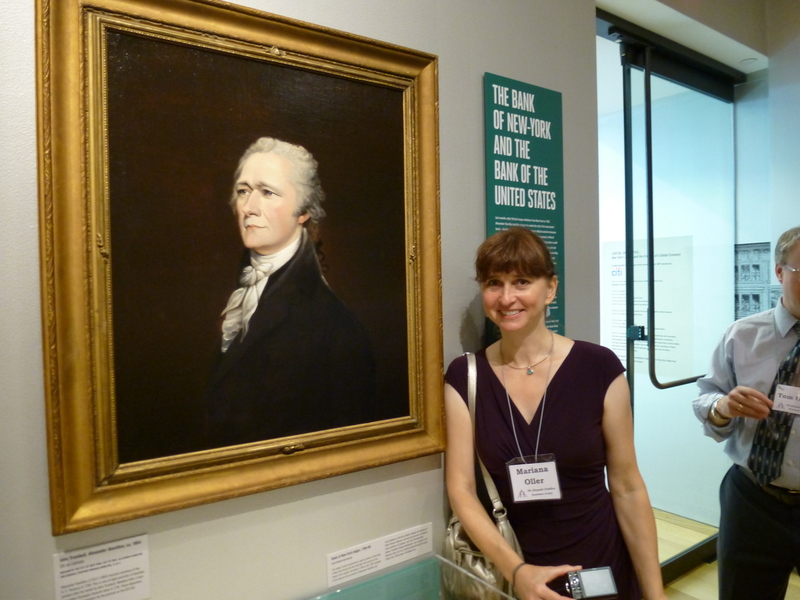 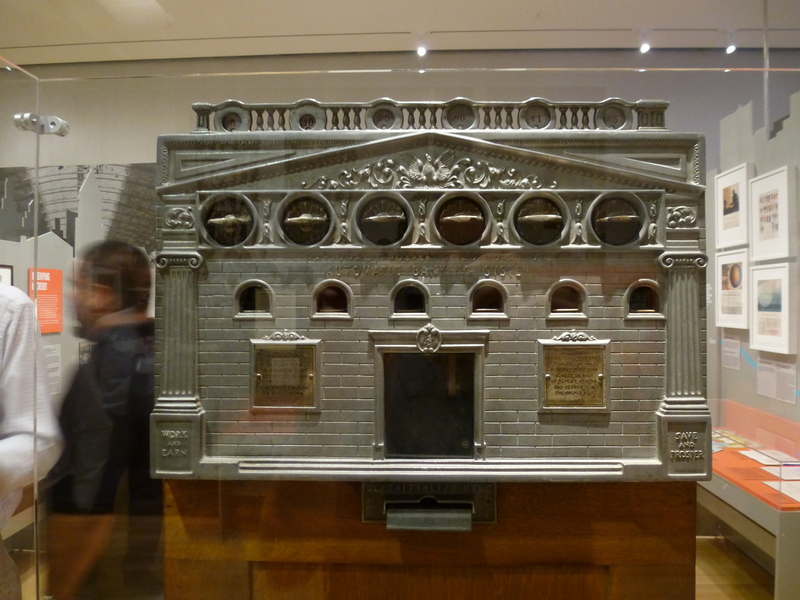 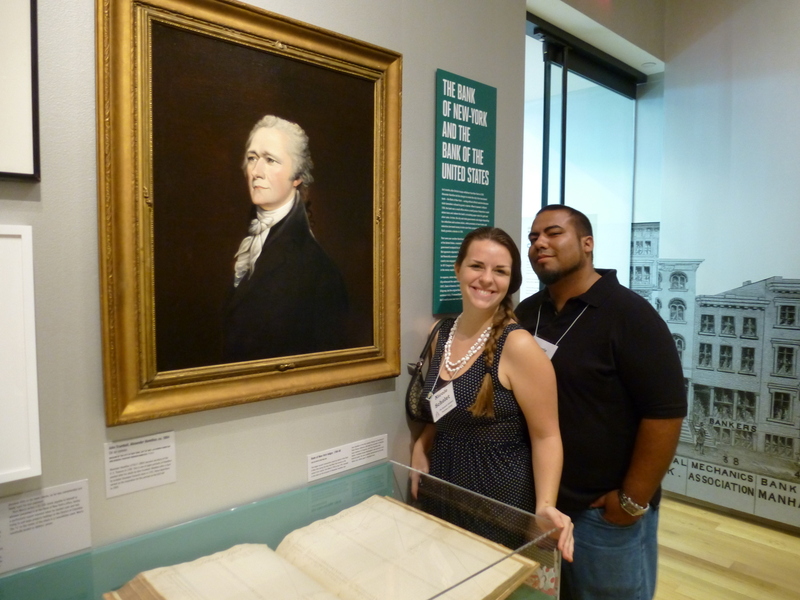 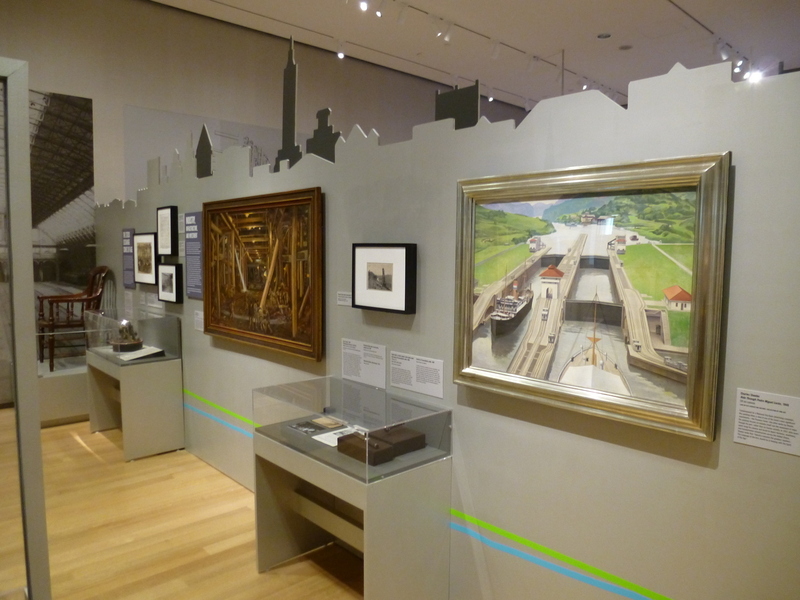 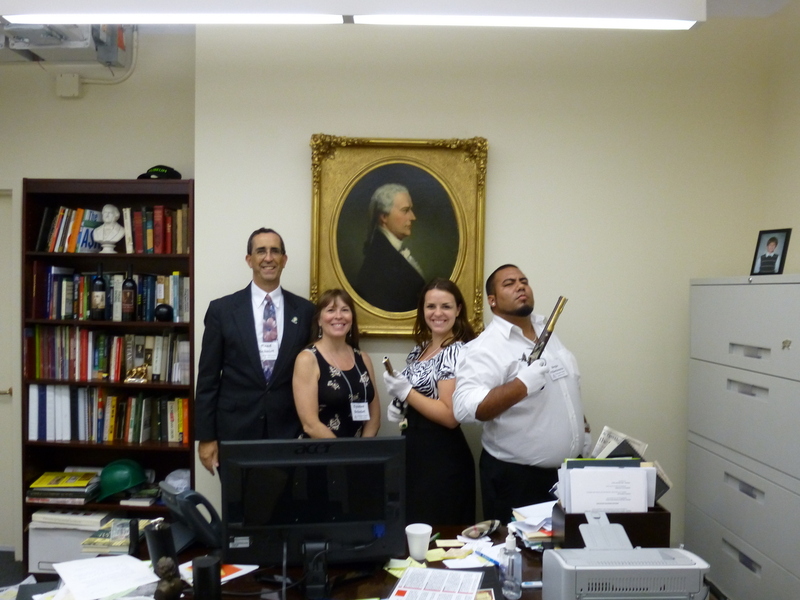 Alexander Hamilton memorial events: July 12–Downtown NYC. 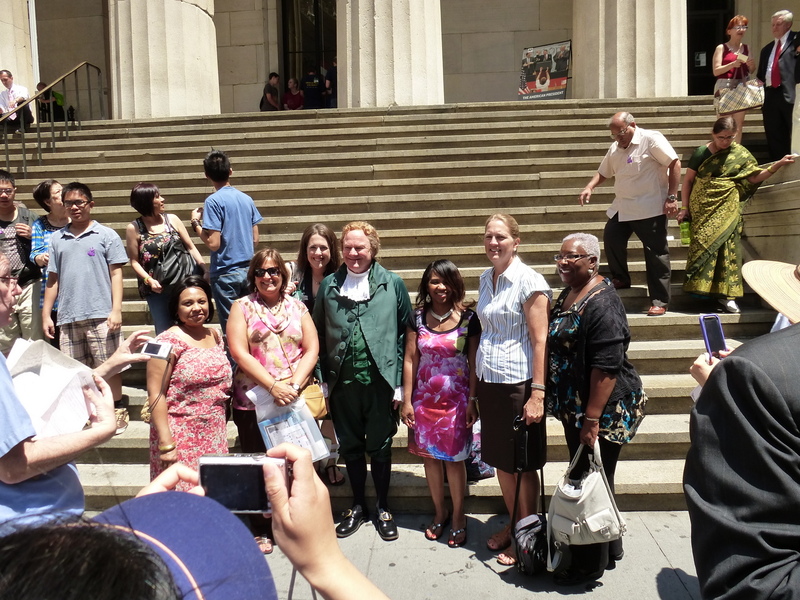 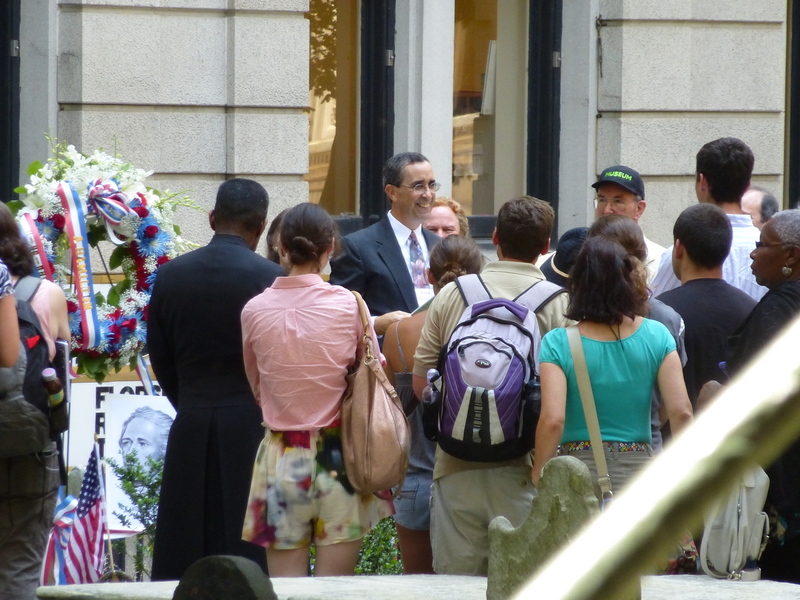 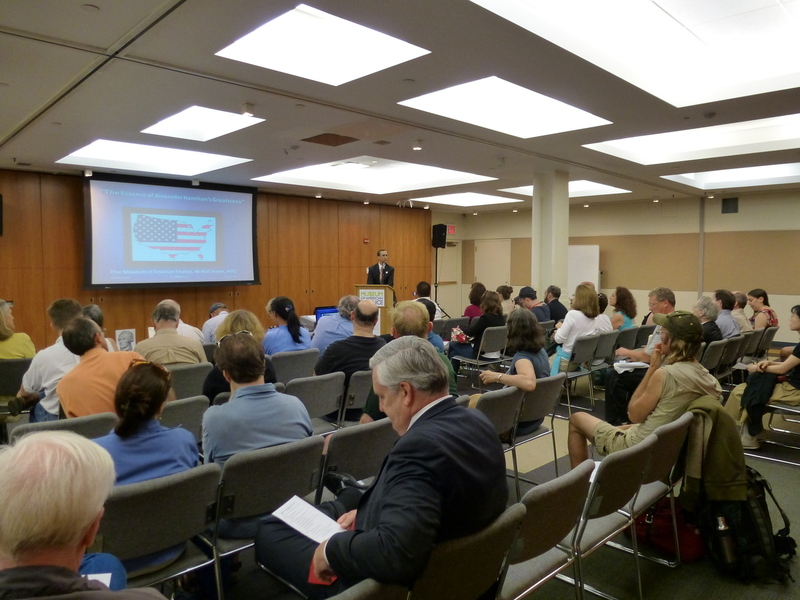 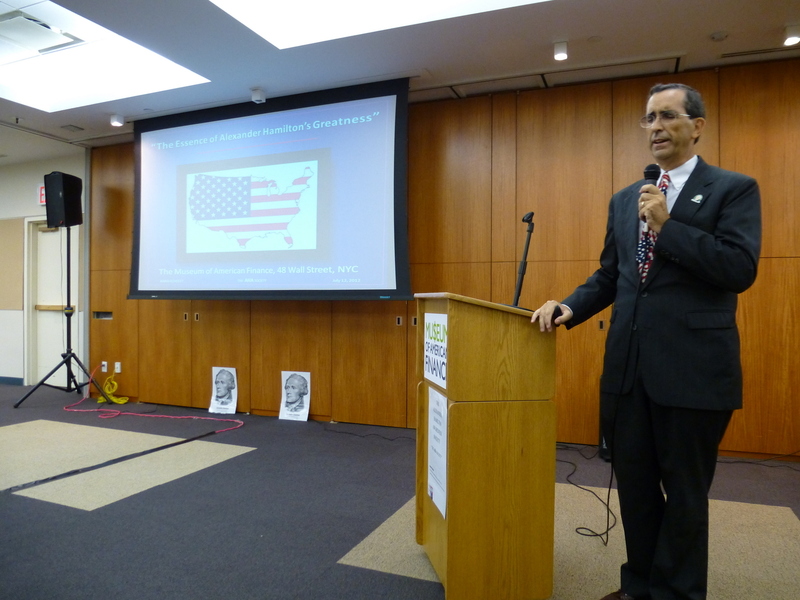 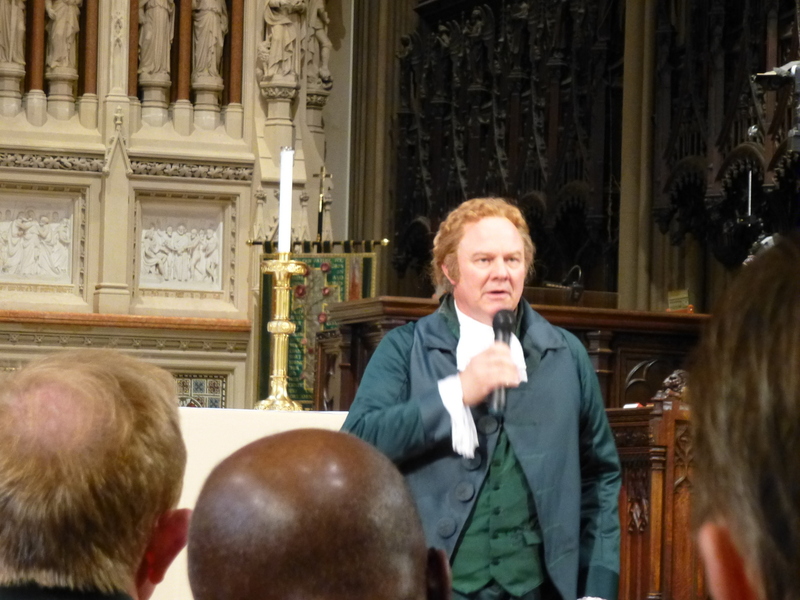 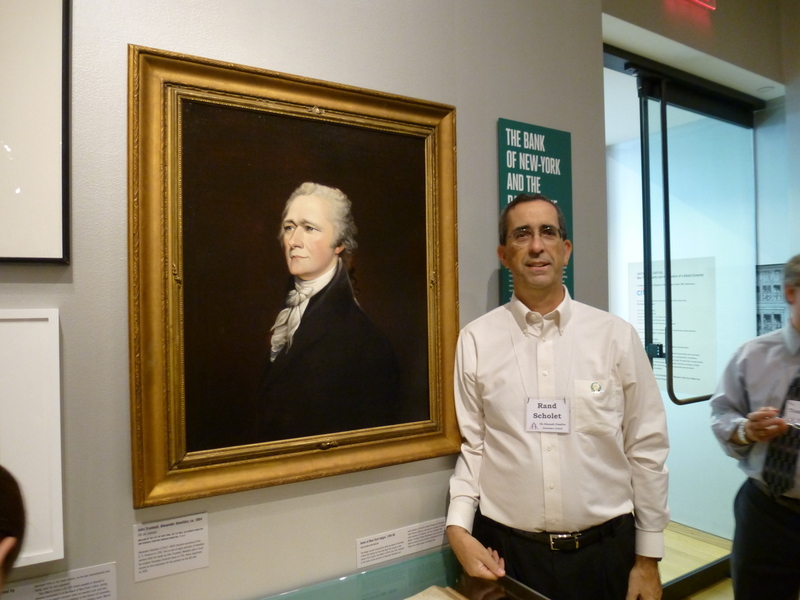 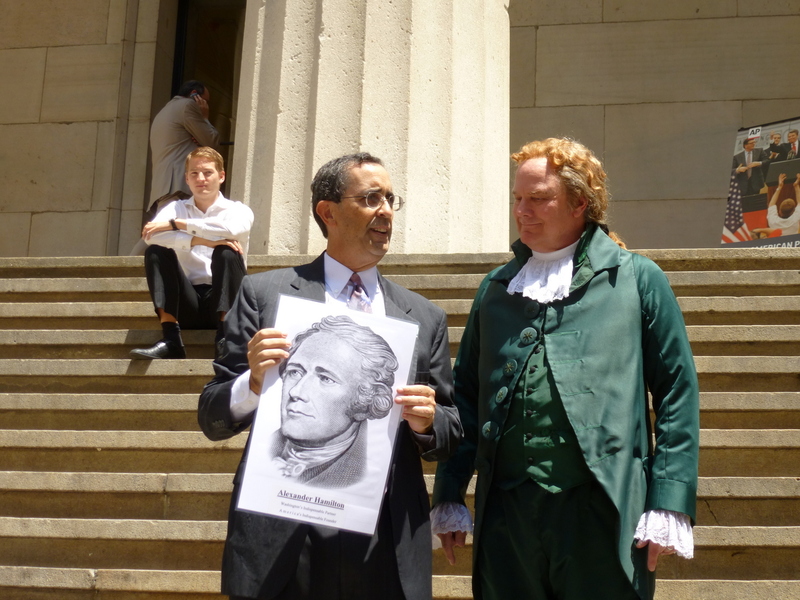 On July 12, 2012, the 208th anniversary of Hamilton’s death, the Alexander Hamilton Awareness Society organized a series of events in downtown New York City. 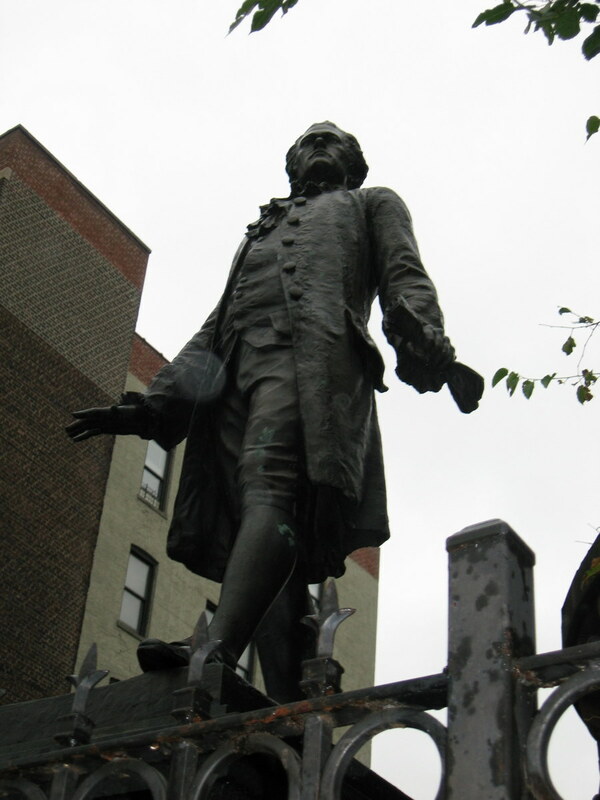 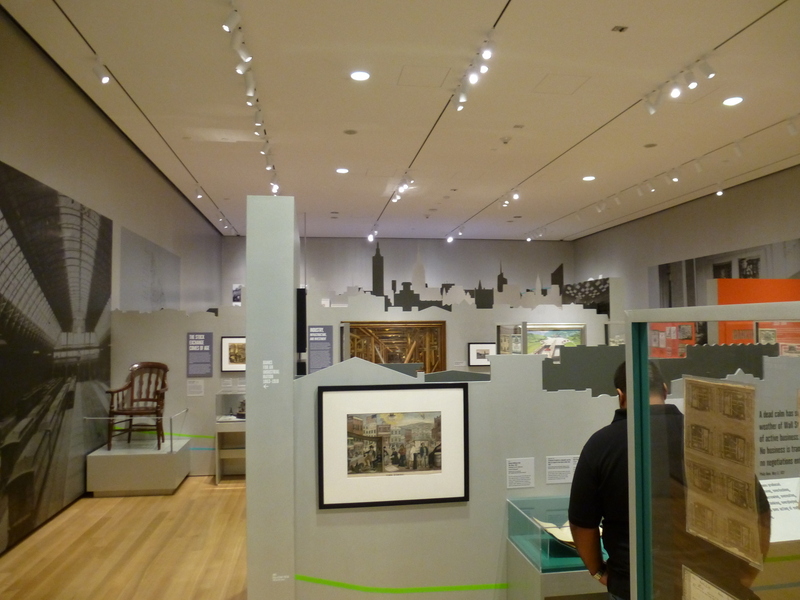 Much of Hamilton’s work and life was spent in downtown Manhattan. 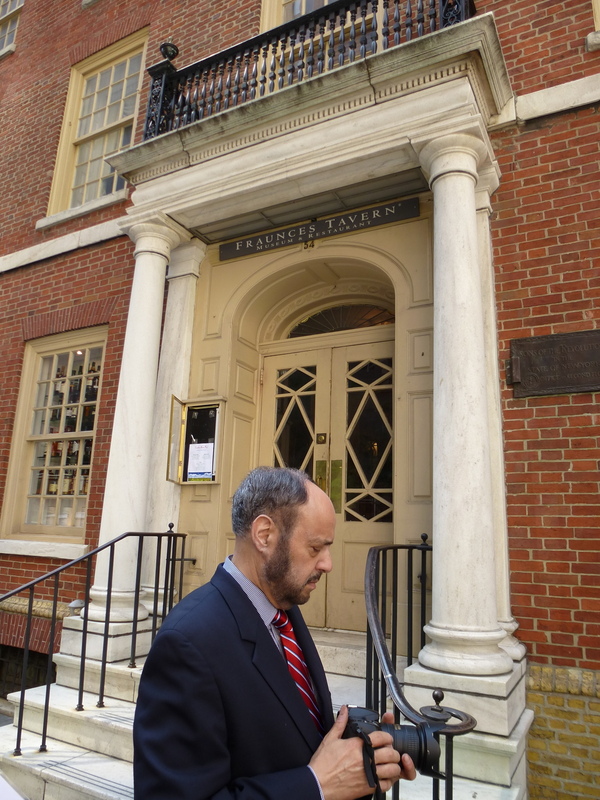 He lived downtown for a number of years and had offices there as well. 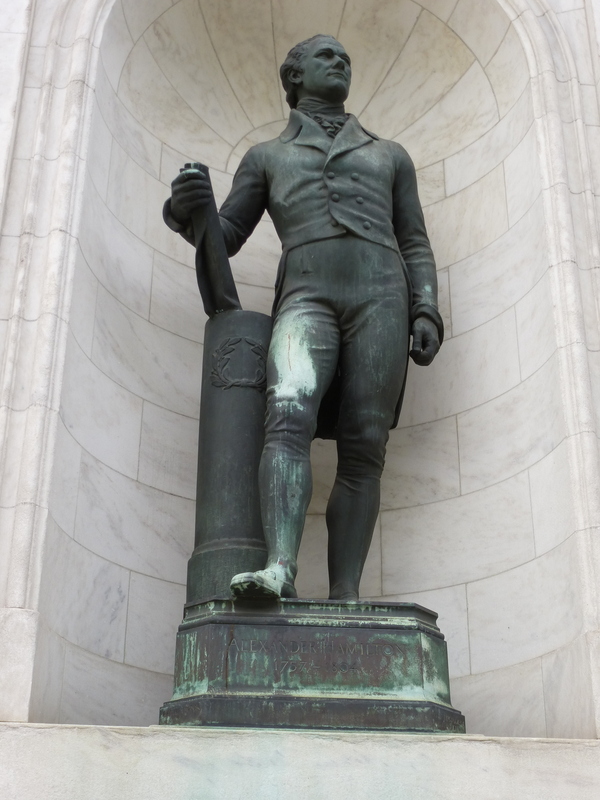 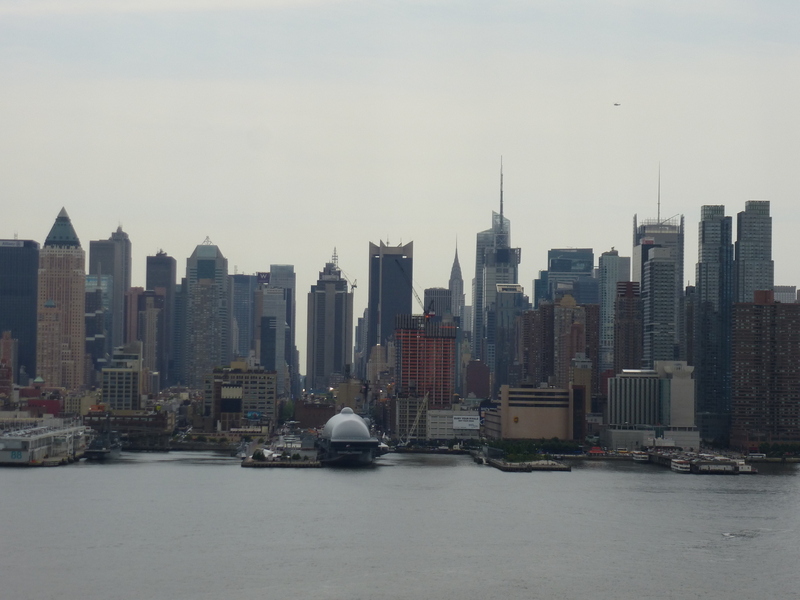 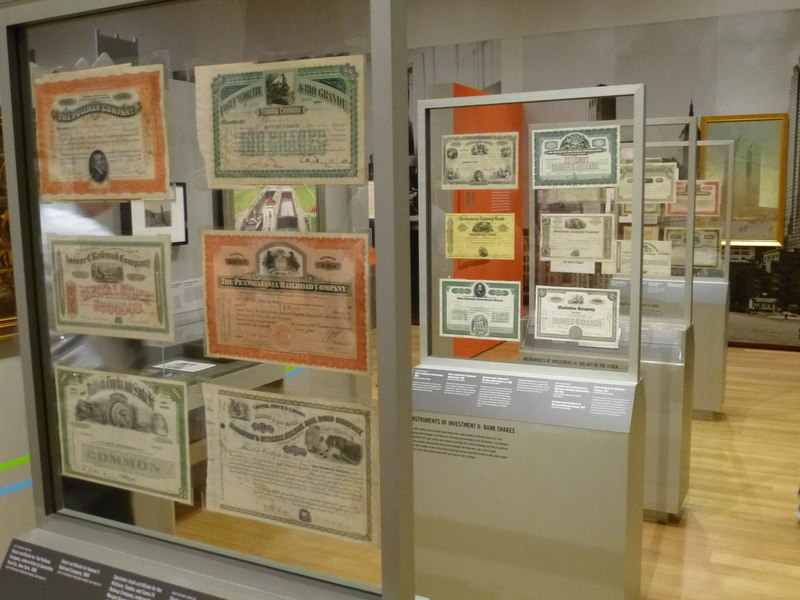 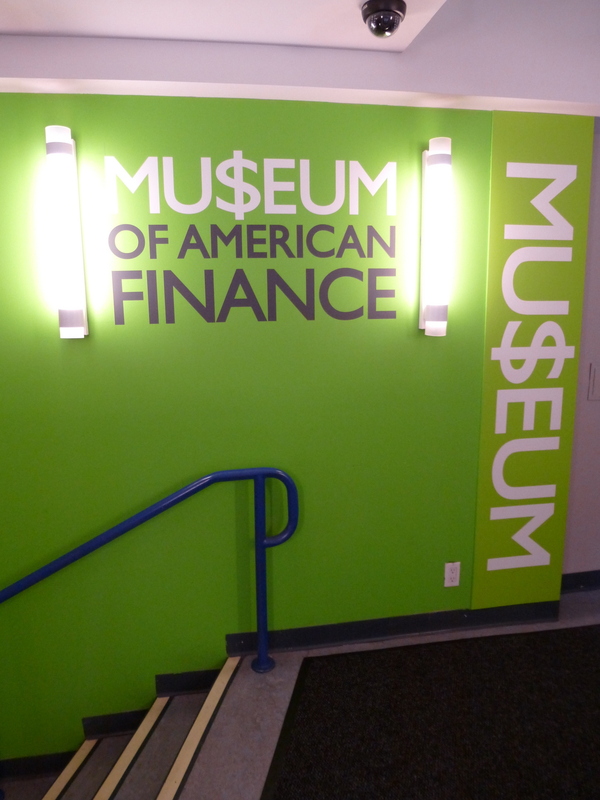 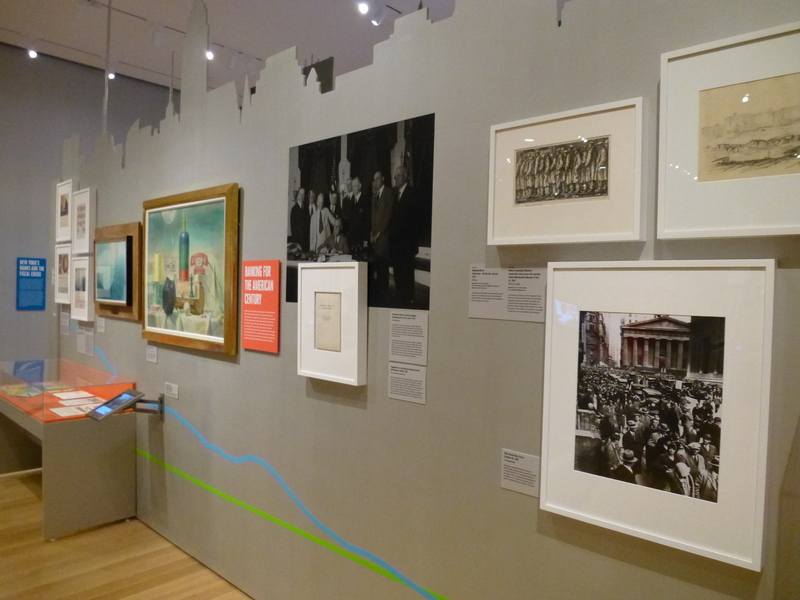 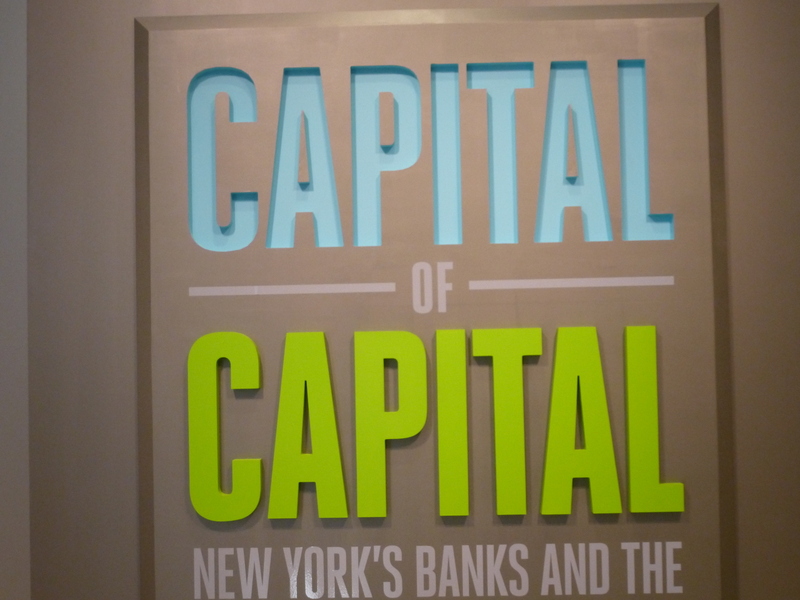 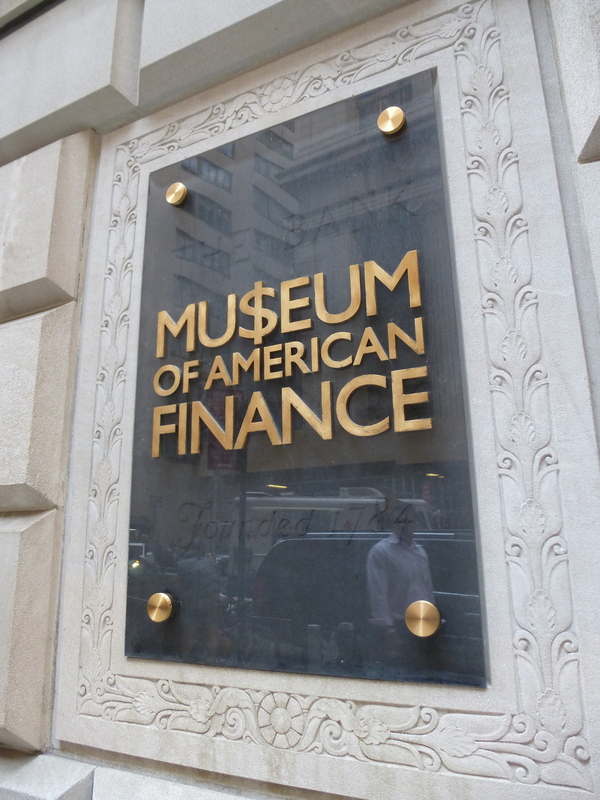 Even more, downtown New York became the financial capital of the United States (some would say the world, but that would take another century) thanks largely to the various projects of Alexander Hamilton. 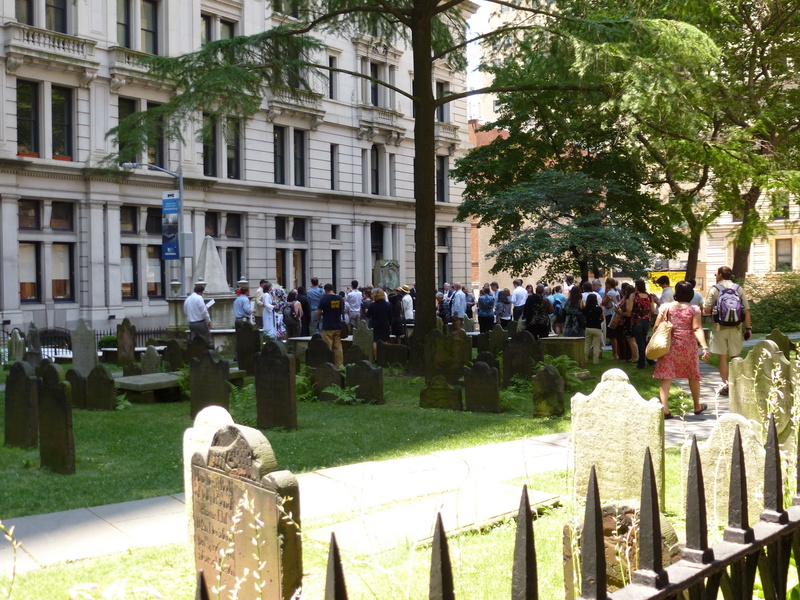 There could be no more appropriate place to celebrate Hamilton’s life and mourn his death than in the heart of capitalism and wealth. 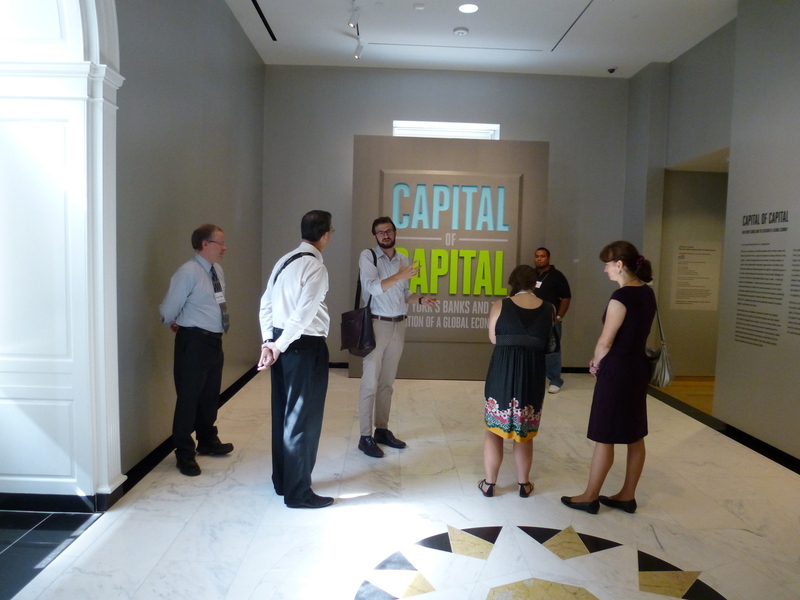 We started with a tour of downtown, led by Arthur Piccolo, Chairman of the Bowling Green Association. 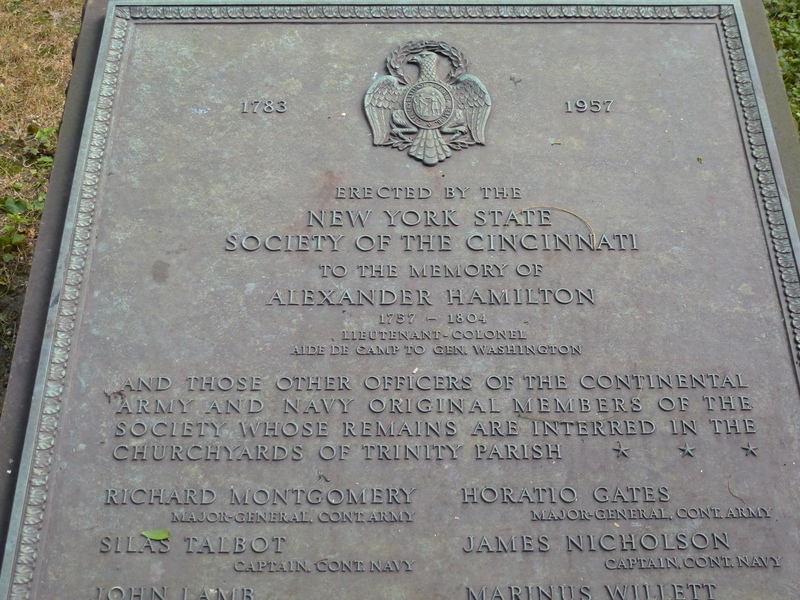 Mr. Piccolo took us the sites where Hamilton trained his troops during the War for Independence, where he lived, where he worked, and where he socialized. 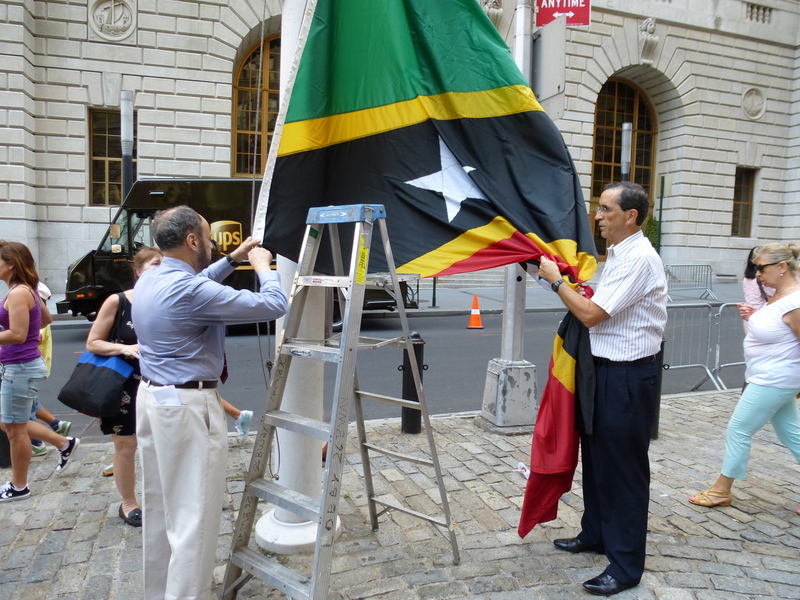 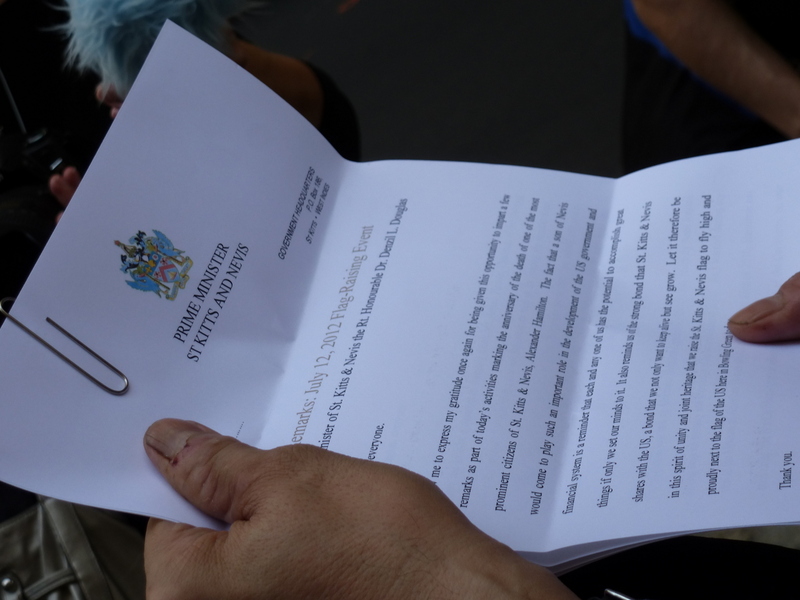 In addition, Mr. Piccolo raised the flag of St. Kitts-Nevis, Hamilton’s place of birth, and read a letter from the Prime Minister of that nation. 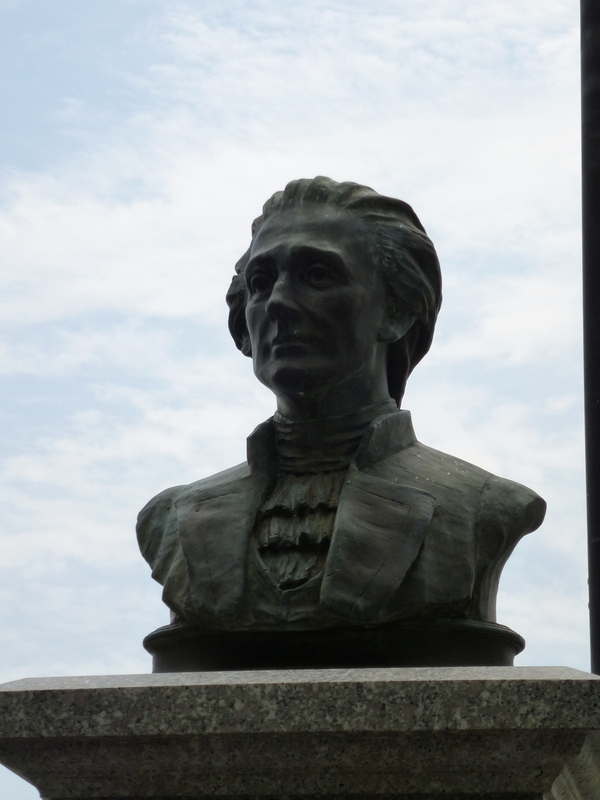 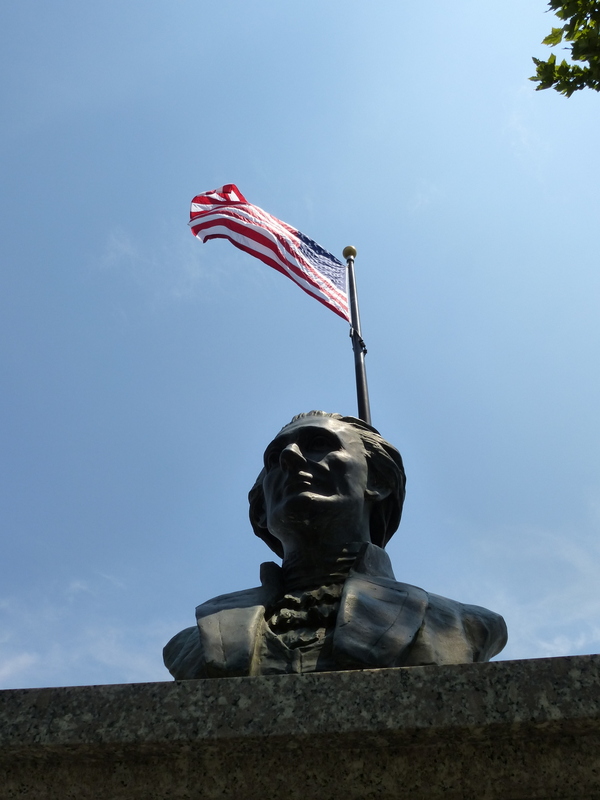 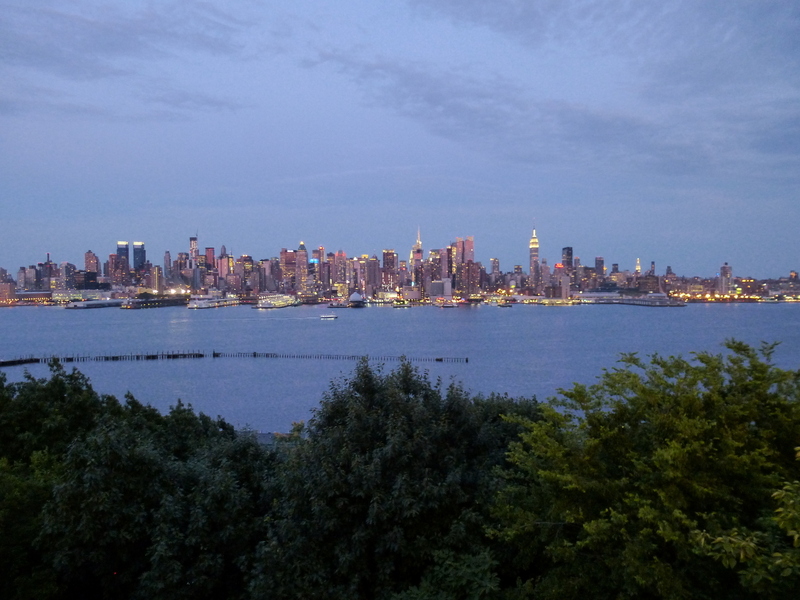 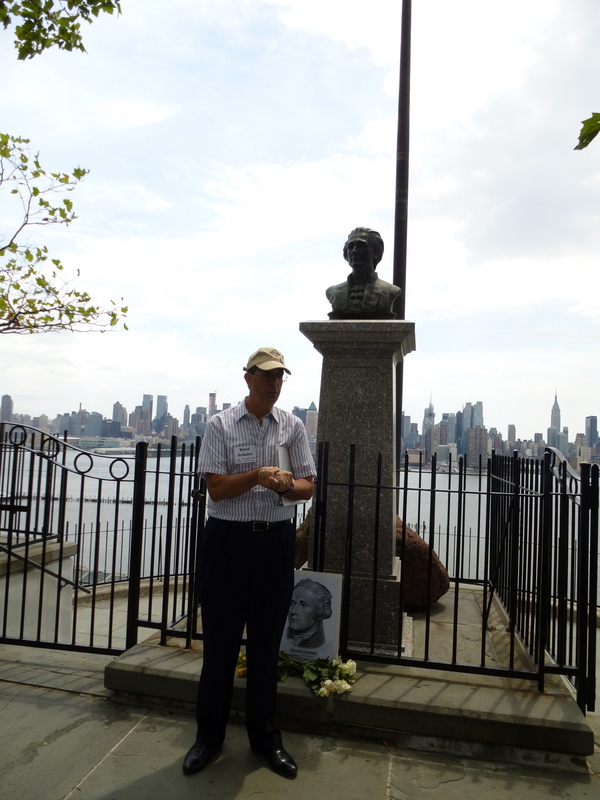 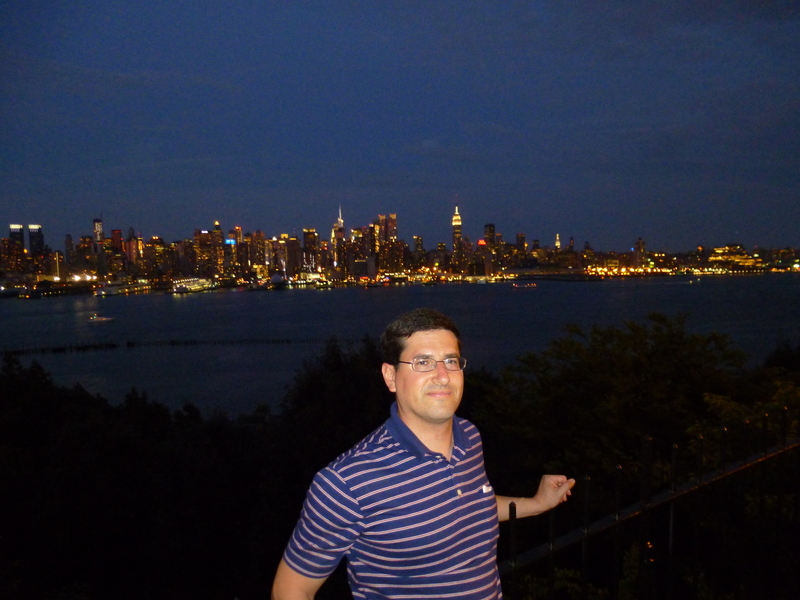 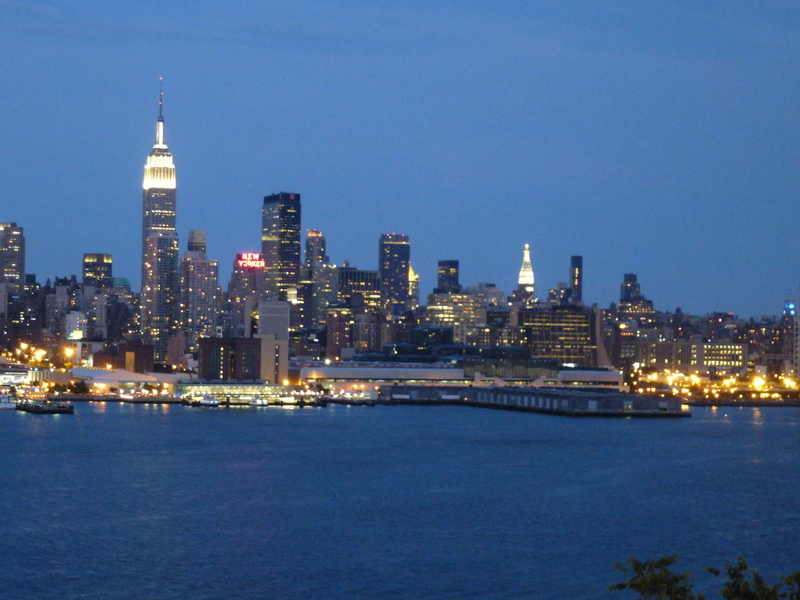 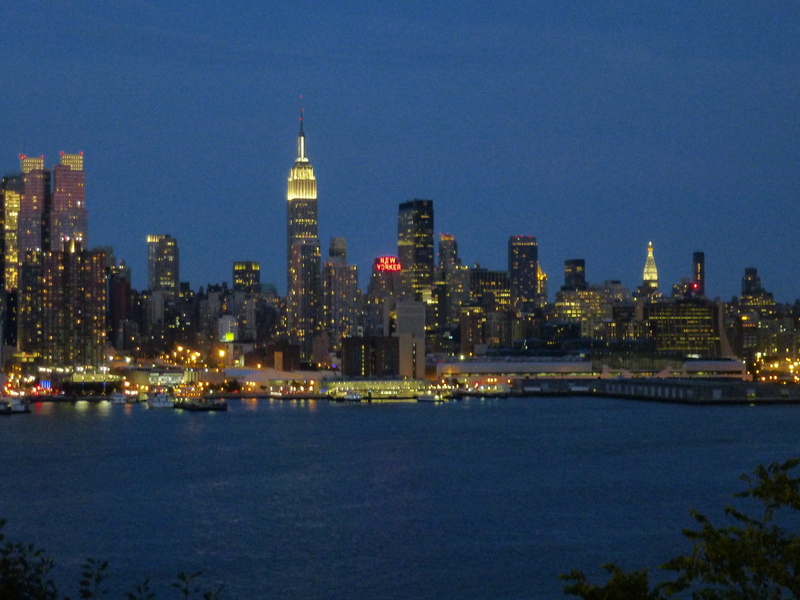 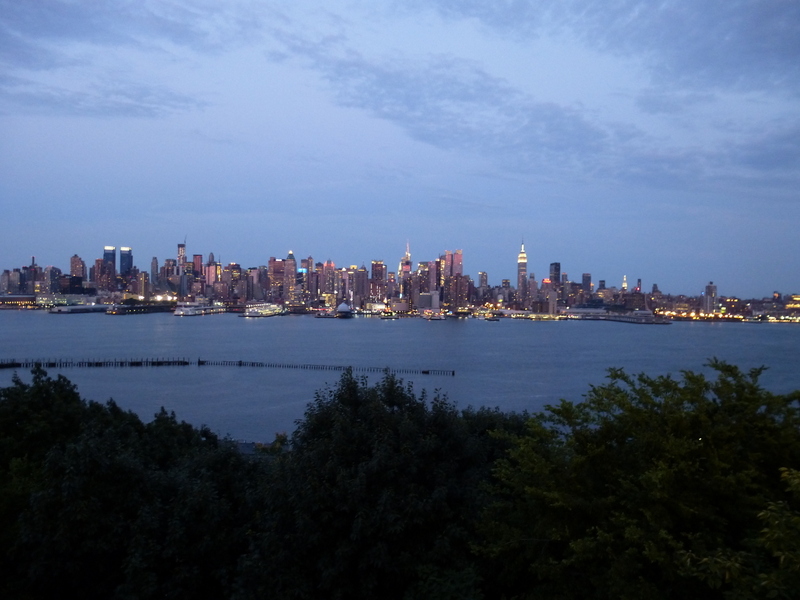 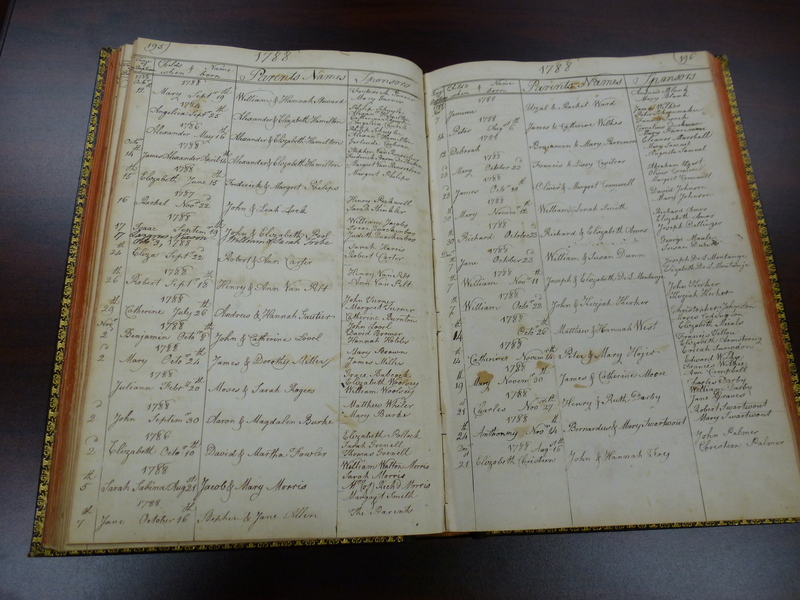 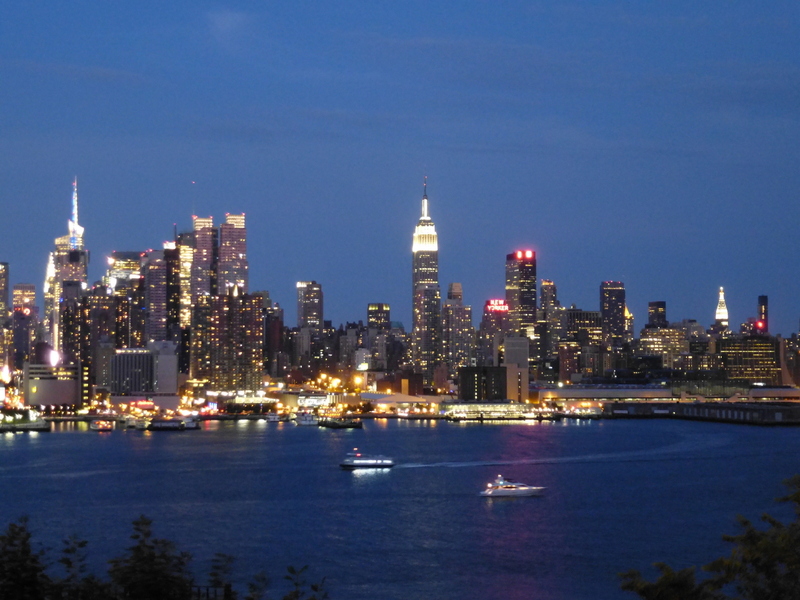 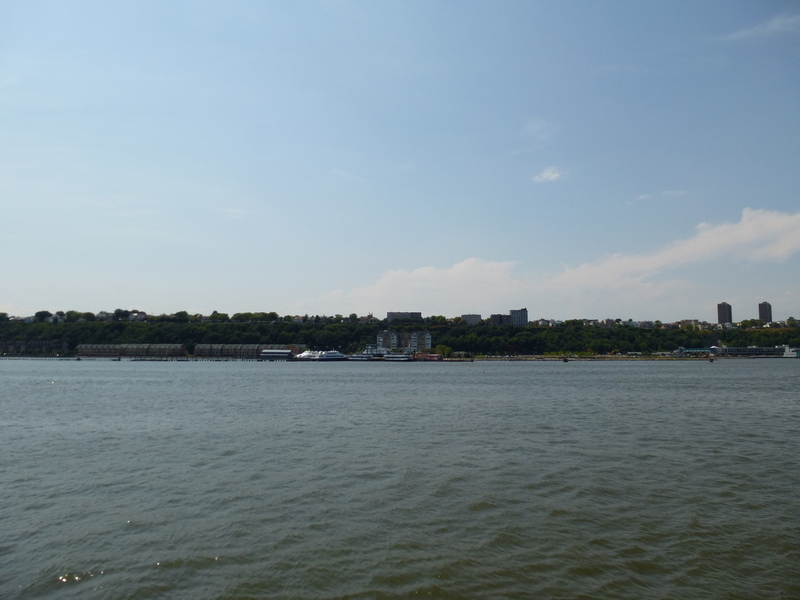 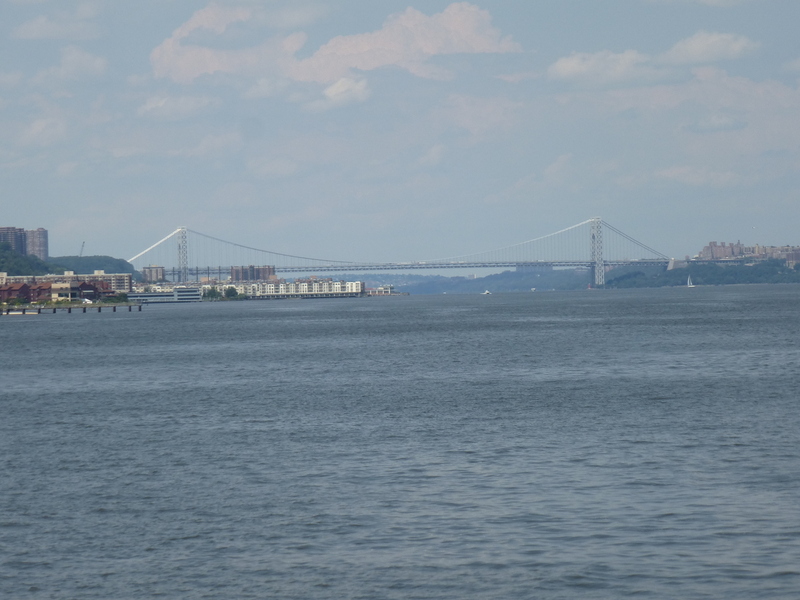 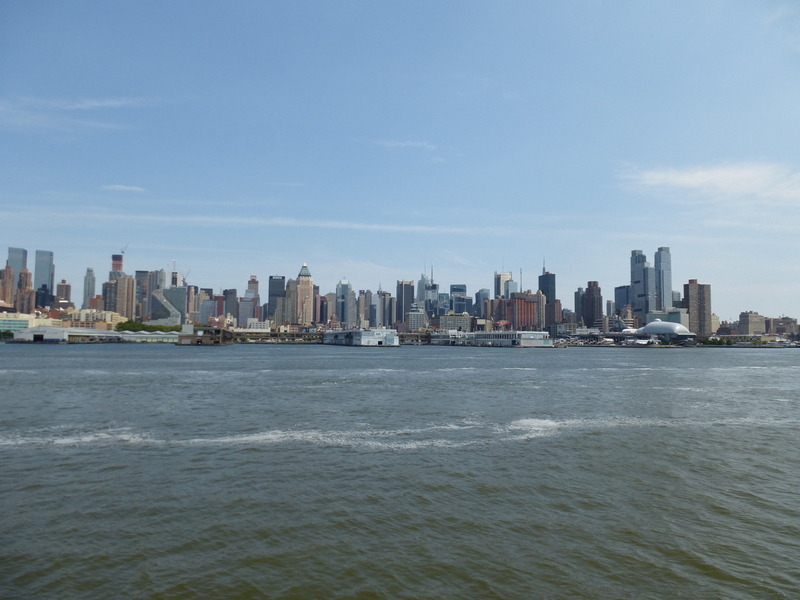 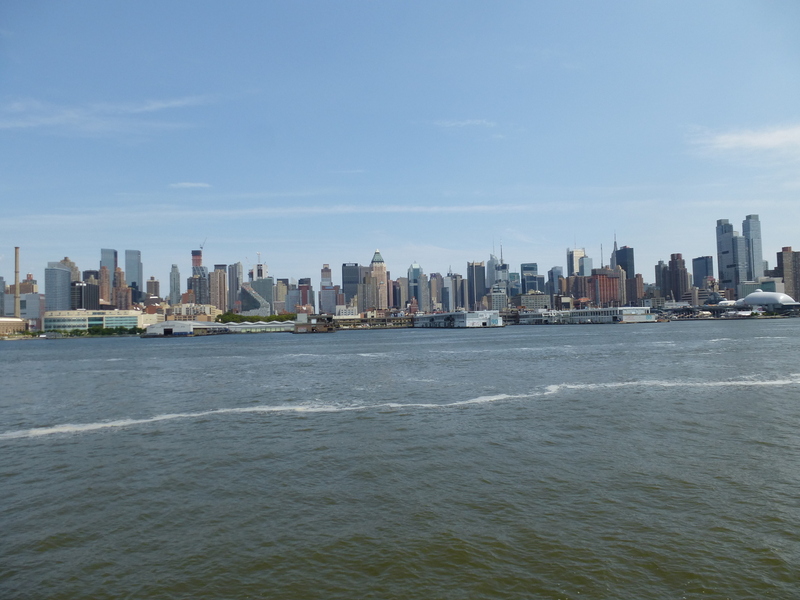 Alexander Hamilton memorial events: July 11–Weehawken. 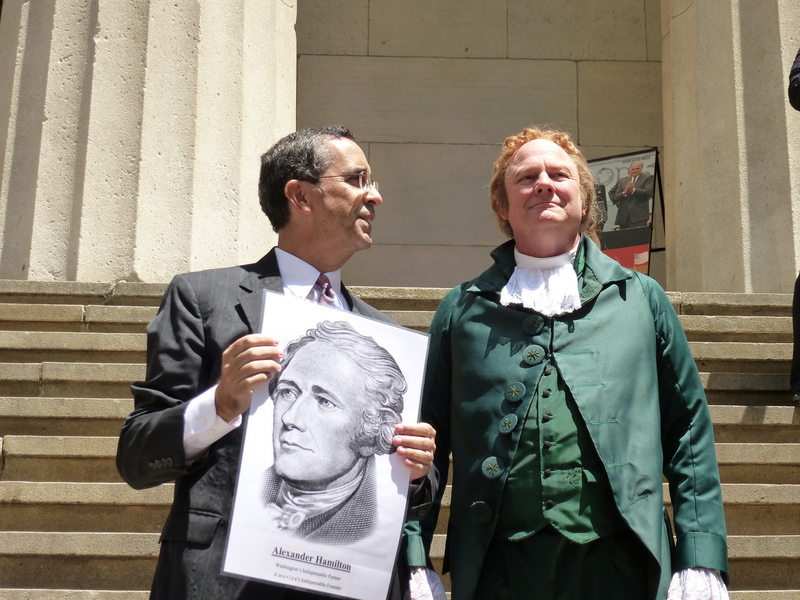 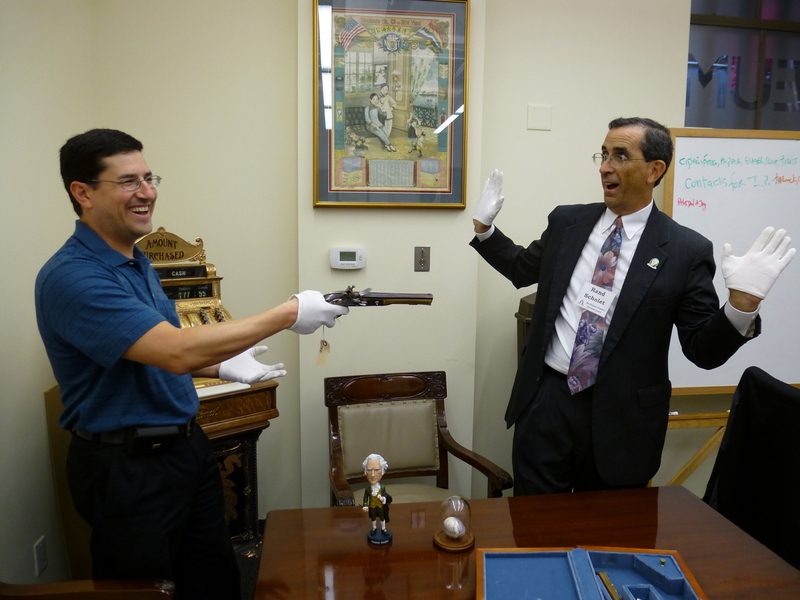 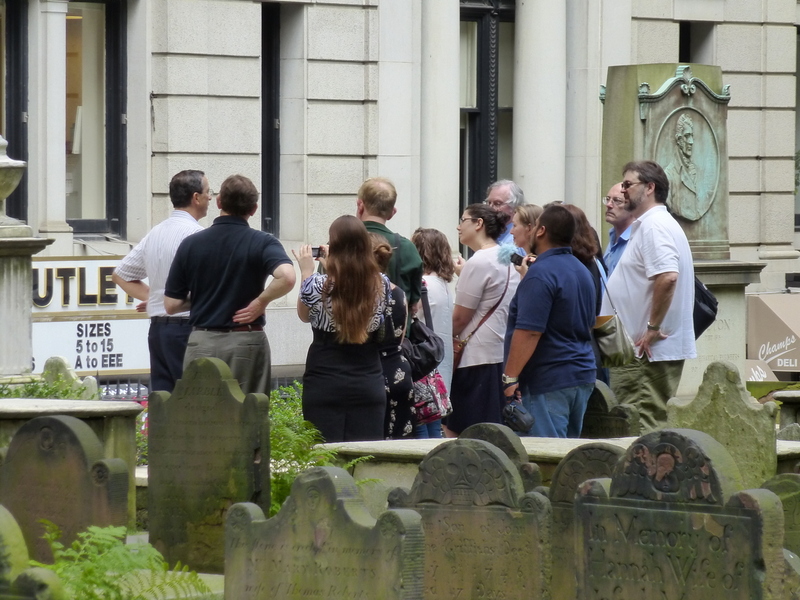 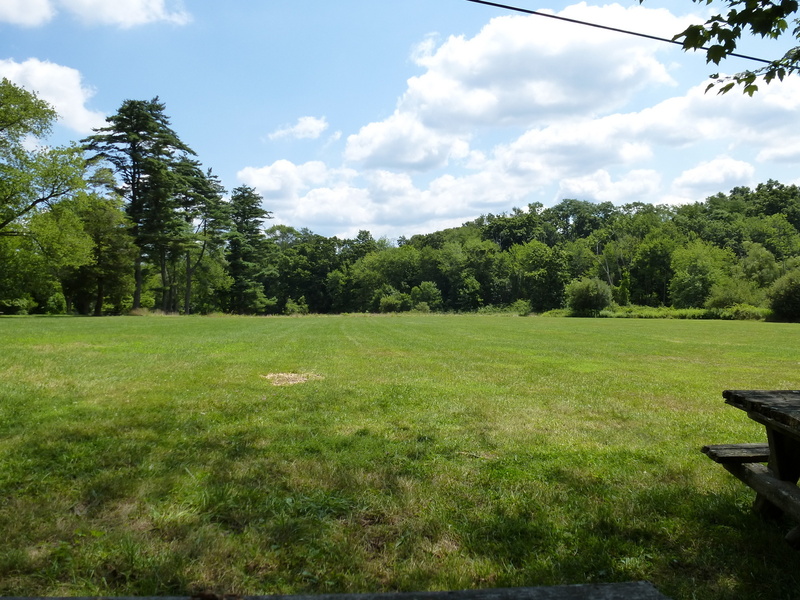 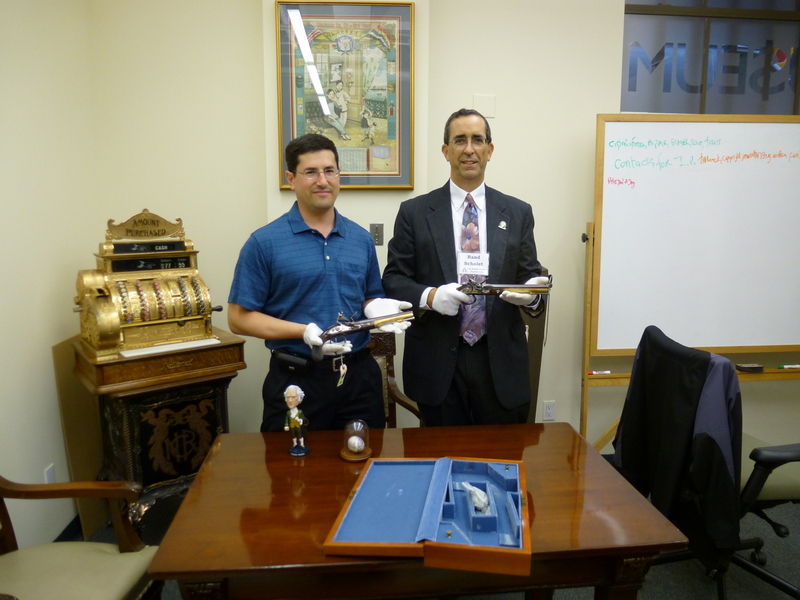 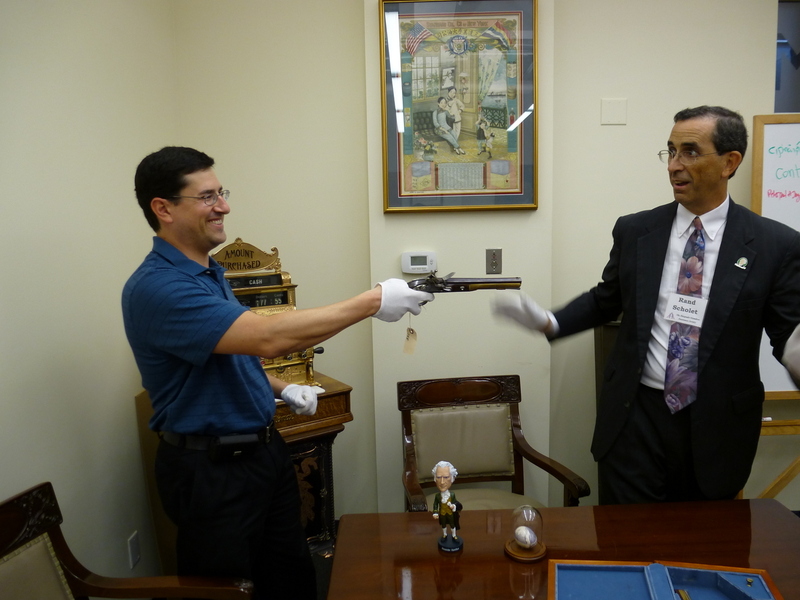 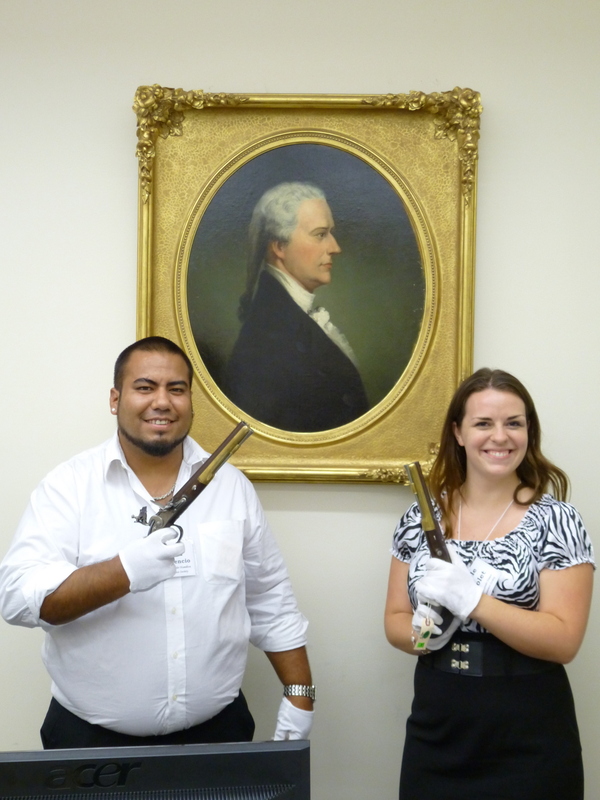 Last month, the Alexander Hamilton Awareness Society organized a series of event to commemorate the anniversary of the famous duel between Alexander Hamilton and Aaron Burr on July 11, 1804, Hamilton’s death on July 12, and his funeral on July 14. 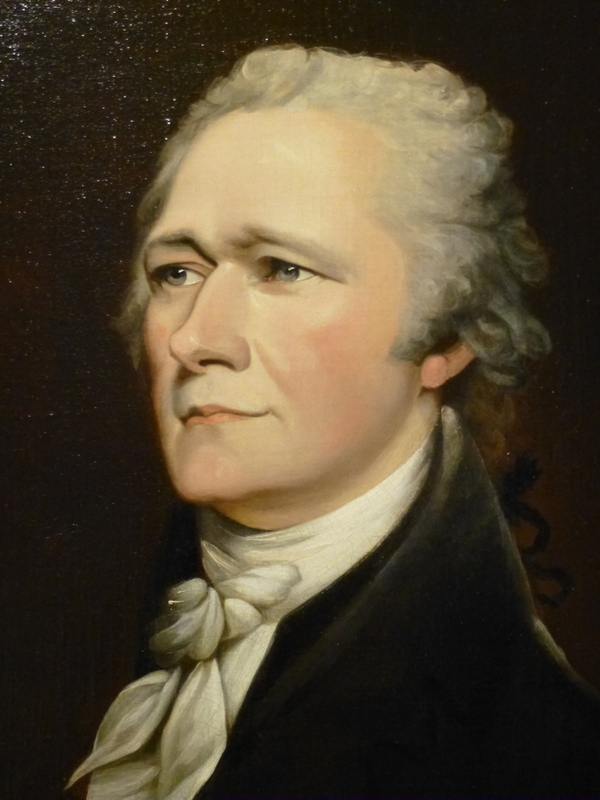 As you already know, I am currently writing a book about Alexander Hamilton. 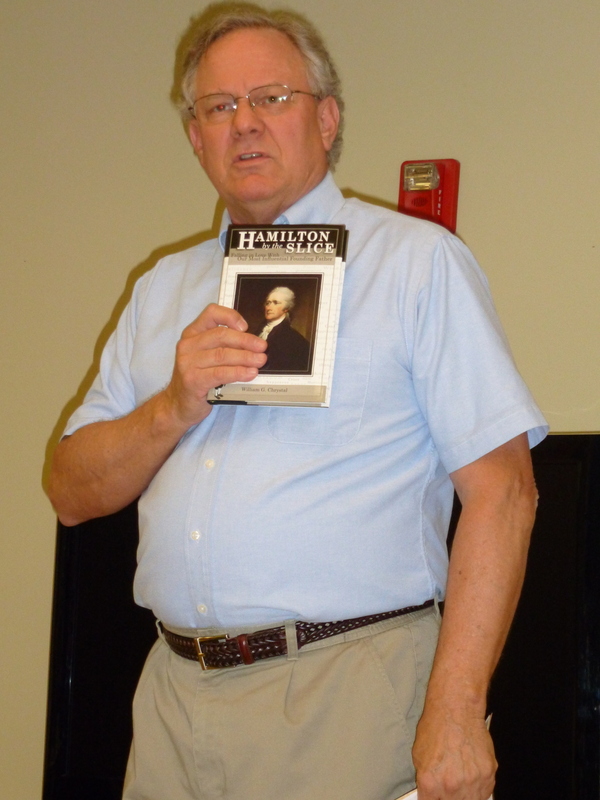 I figured that these events would be a great way to learn even more about Hamilton and to meet other Hamilton experts. 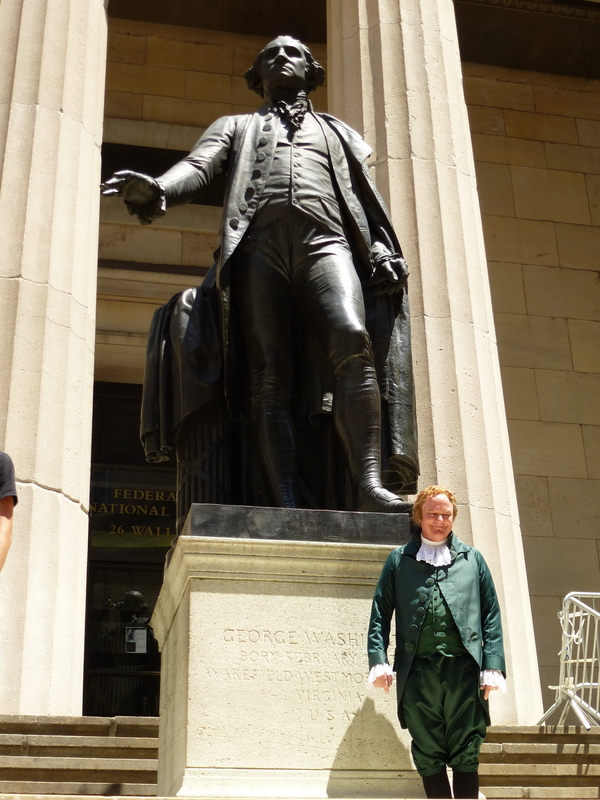 I was not disappointed on either account. 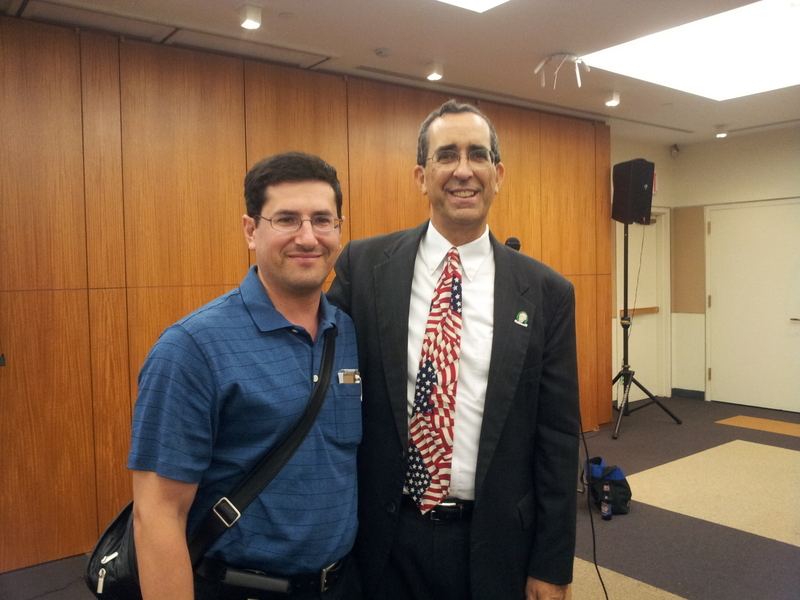 In a series of blog posts, I’ll share with you some of my experiences at these events. 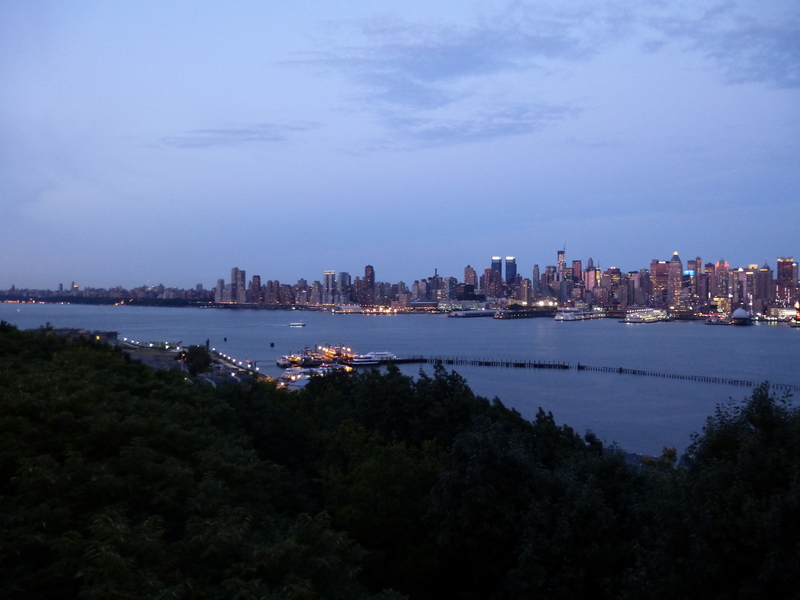 As you’ve probably figured out from some of my recent posts, I also enjoy photography. 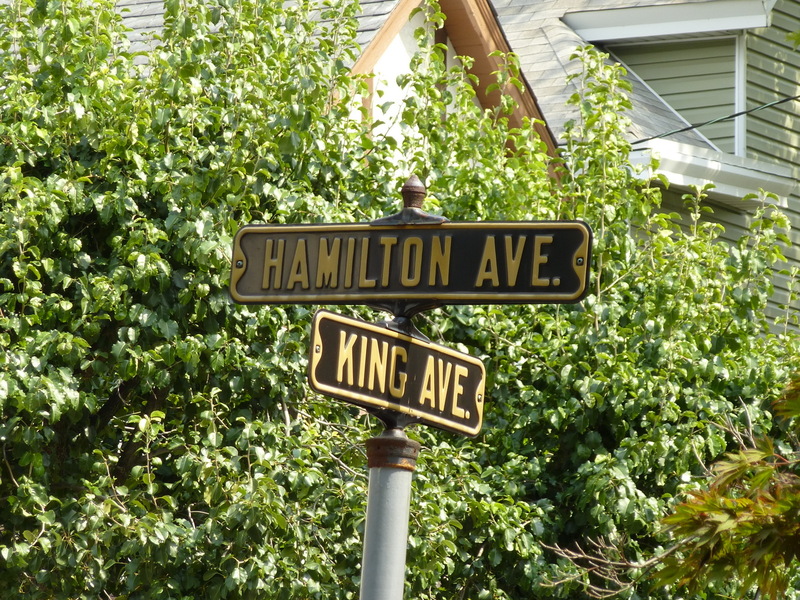 I took hundreds of photos as these Hamilton events. 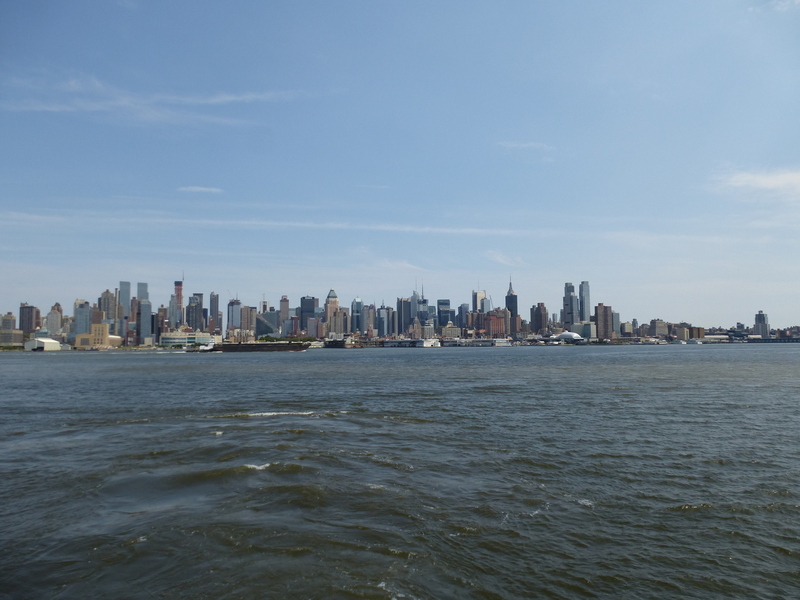 Don’t worry, I’ll only share a few of the best photos. 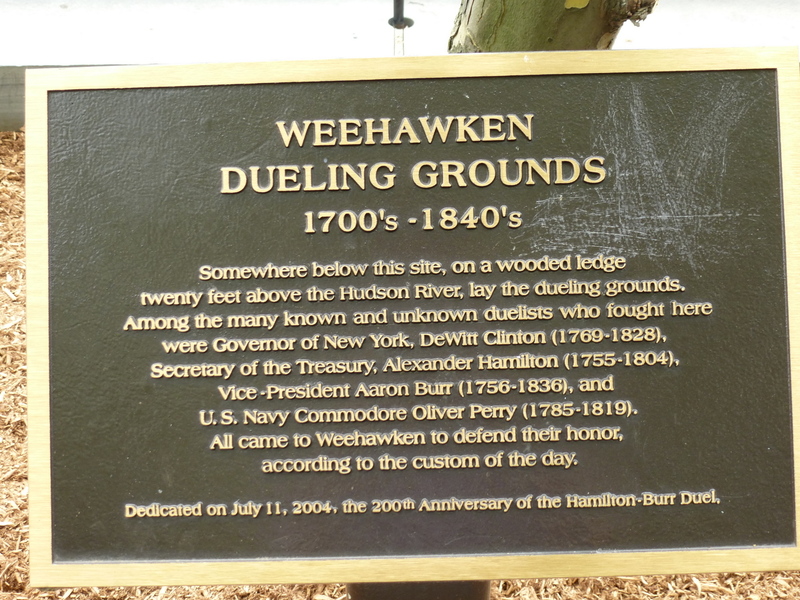 On July 11, we gathered in Weehawken, New Jersey, the location of the famous duel between Alexander Hamilton and Aaron Burr. 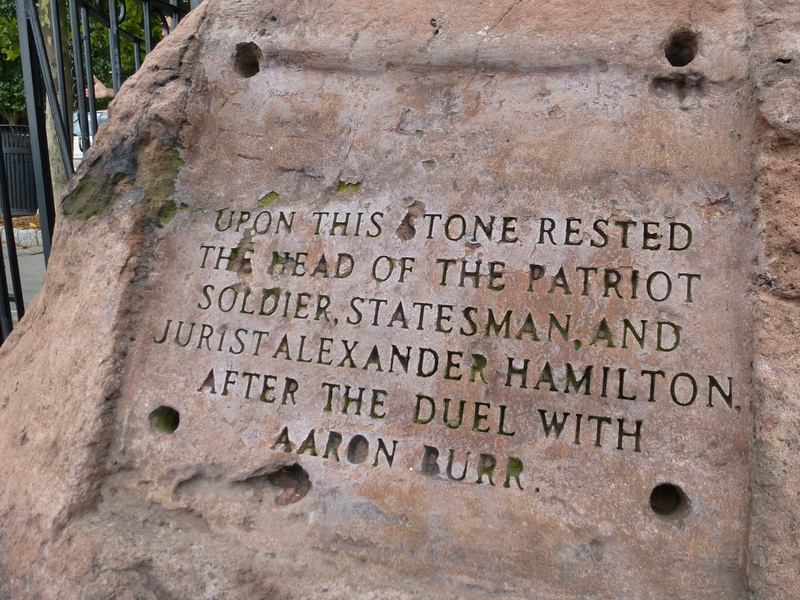 Aaron Burr was the sitting Vice President at the time and Alexander Hamilton was possibly the country’s greatest lawyer after serving his country so admirably for a quarter of a century as a soldier in the army during the revolution, as a representative in New York’s Assembly, as a delegate to the federal Congress, as a delegate to the Constitutional Convention, as the nation’s first Secretary of the Treasury, and as Washington’s second in command during the Quasi-War. 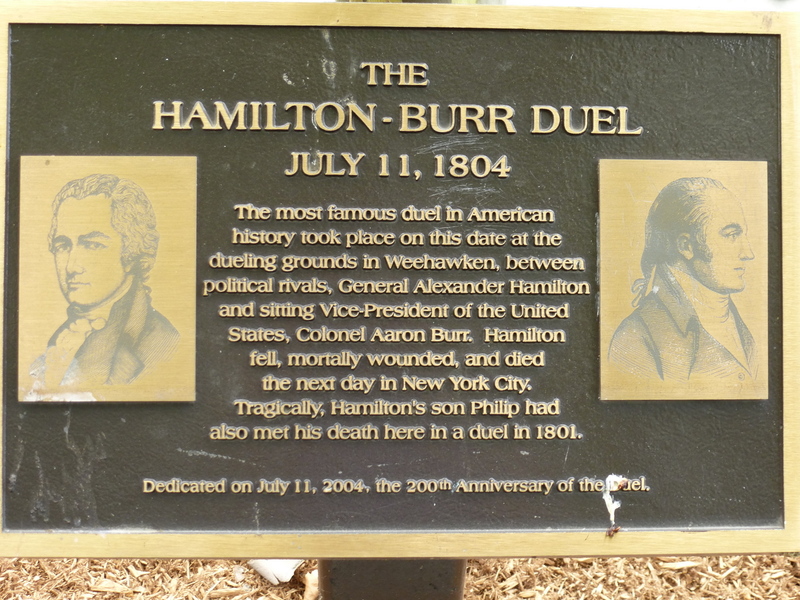 America had seen many duels before, but no duel before or since saw such two illustrious men face each other. 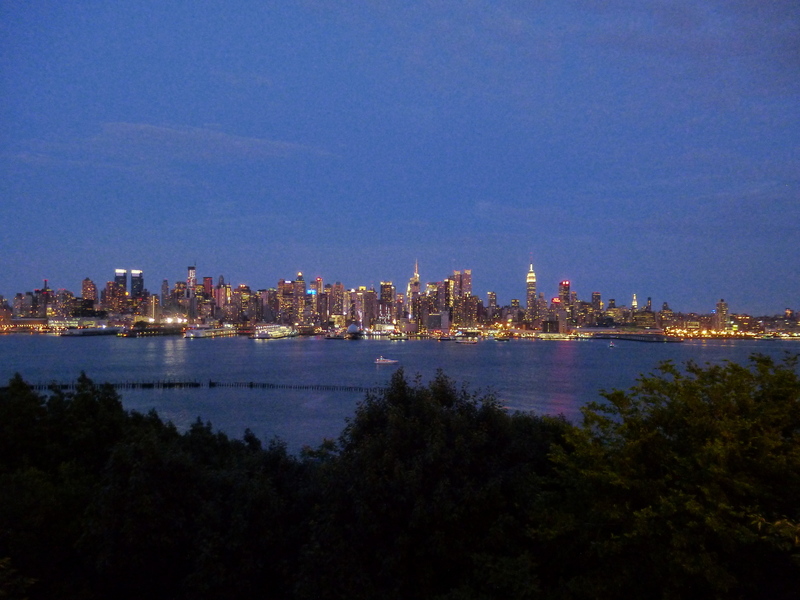 My grandparents have lived in Queens for about 60 years. 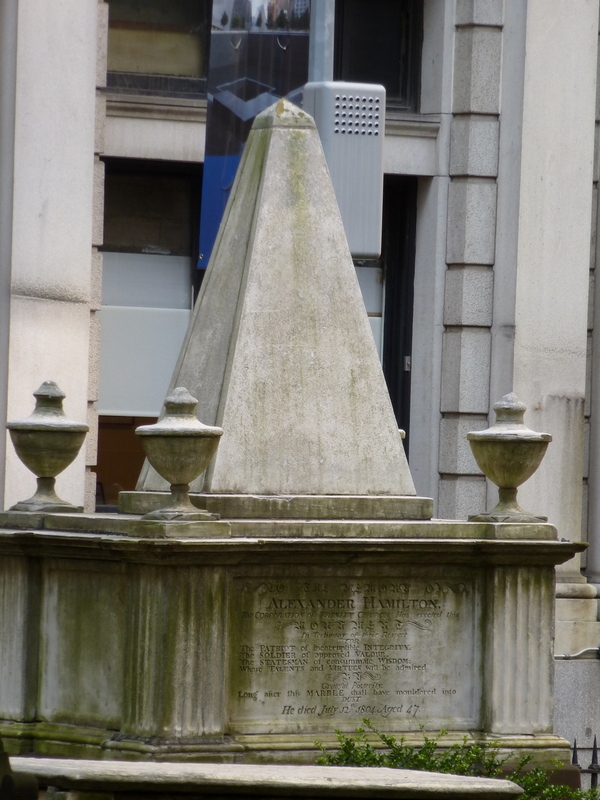 I have been coming to visit them for over thirty years now. 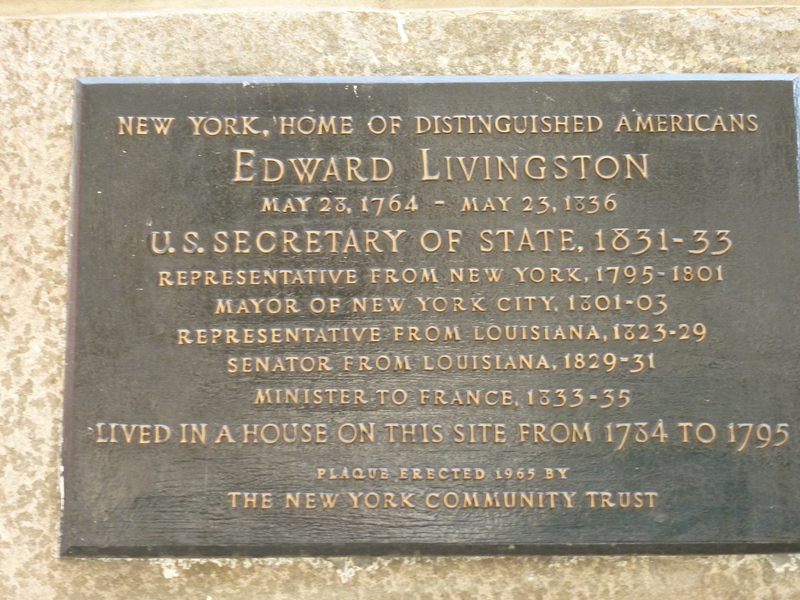 Little did I know that just 3.6 miles away (according to Google Maps) is the house of Rufus King–delegate to the Constitutional Convention, first senator from New York, Minister to Britain, co-author of the Camillus essays (with Alexander Hamilton) supporting the Jay Treaty, and Federalist nominee for Vice President in 1804 and 1808 and for President in 1816. 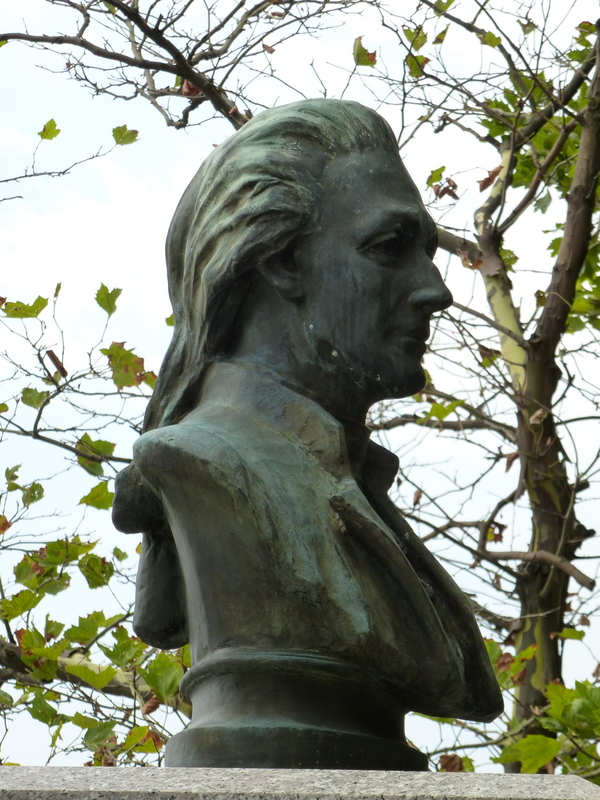 And his house is just a few minutes away from my grandparents! 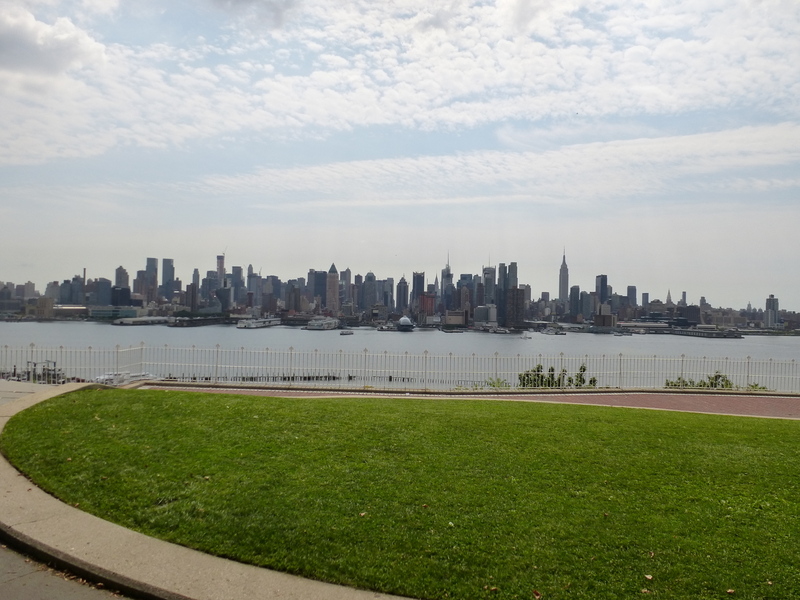 I had to go. 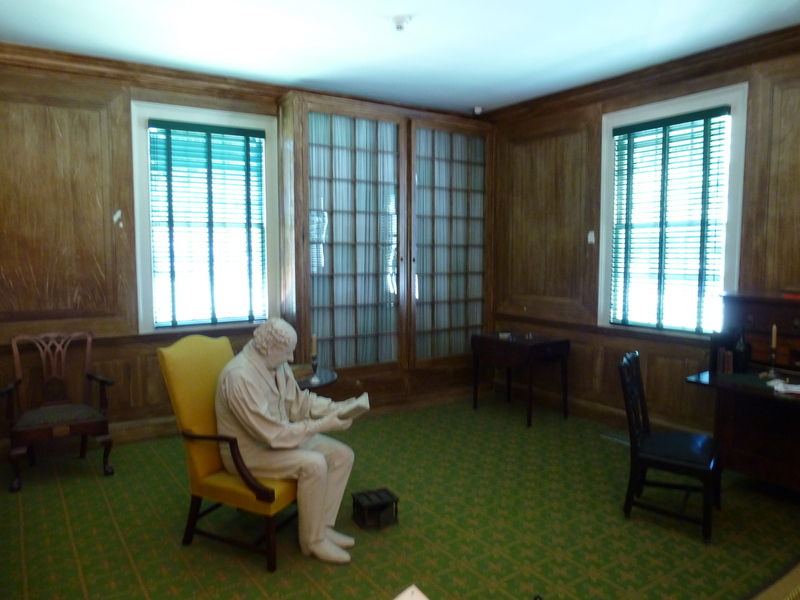 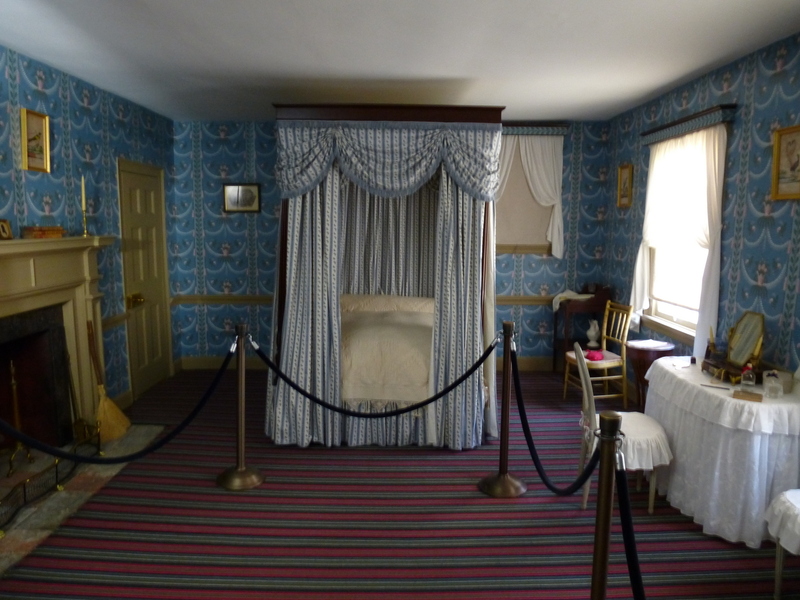 The tour was more about the house than it was about the man, which disappointed someone like me. 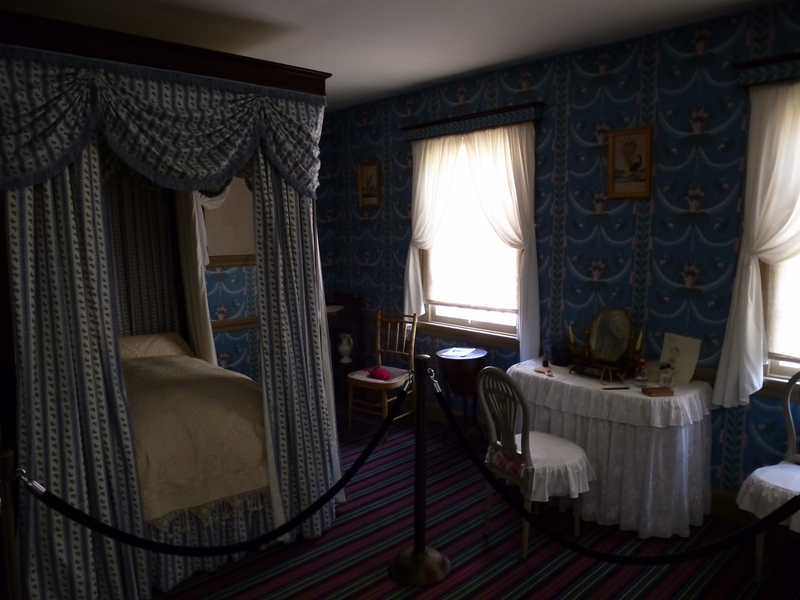 But what the tour lacked, the beautiful home more than made up for. 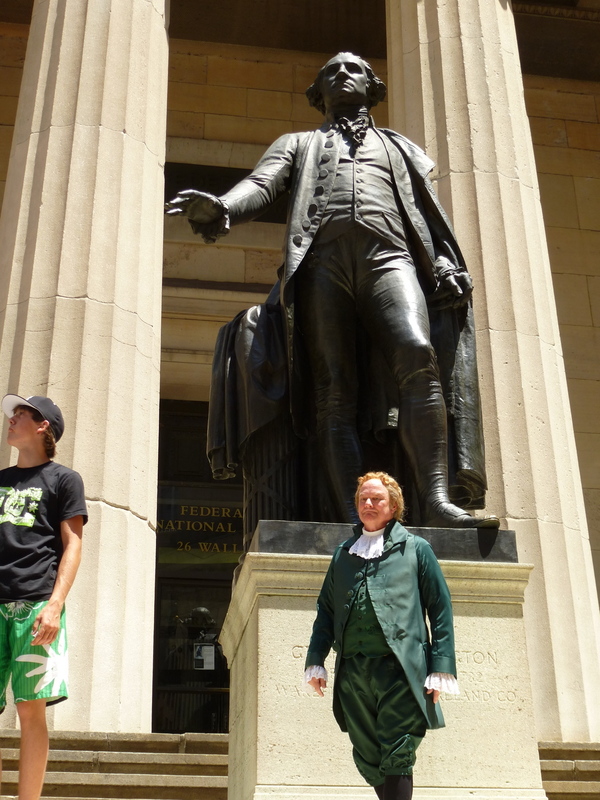 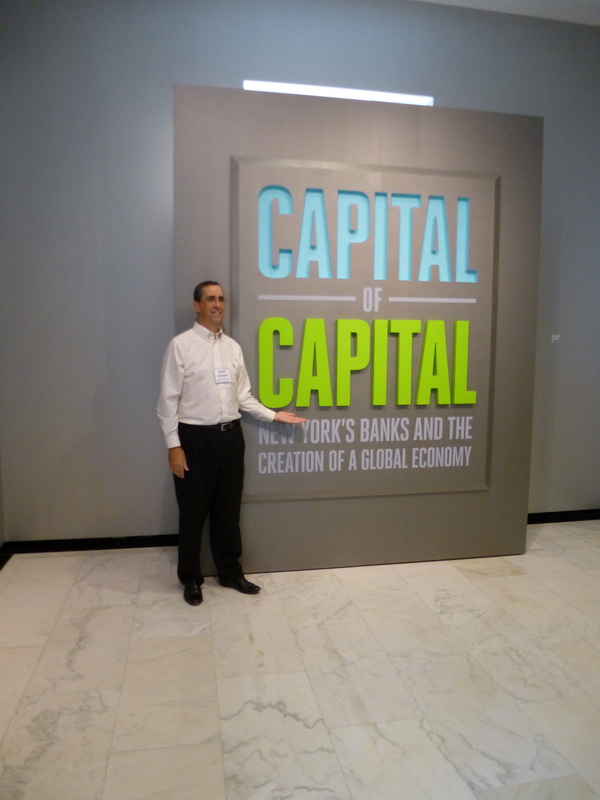 While in New York this summer, I am trying to visit some of the sites of historical significance. 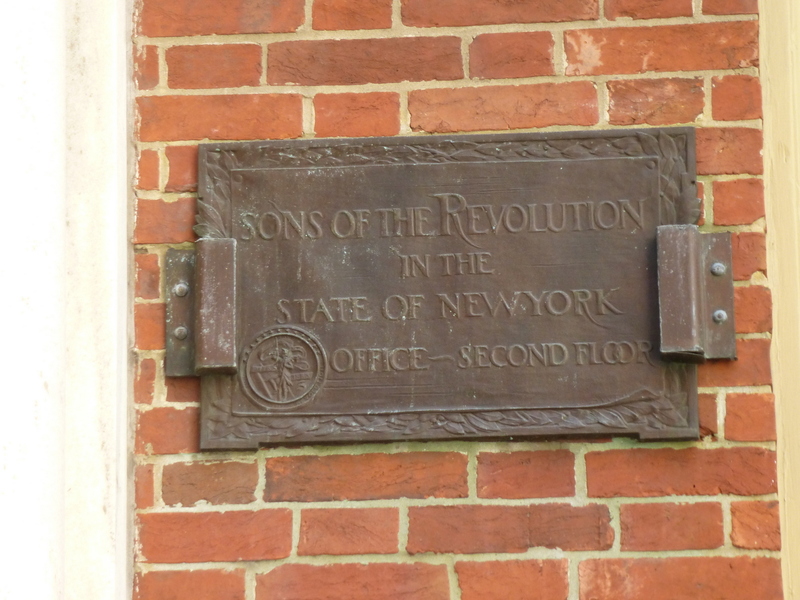 Two recent trips took me to the houses of two leading Founding Fathers. 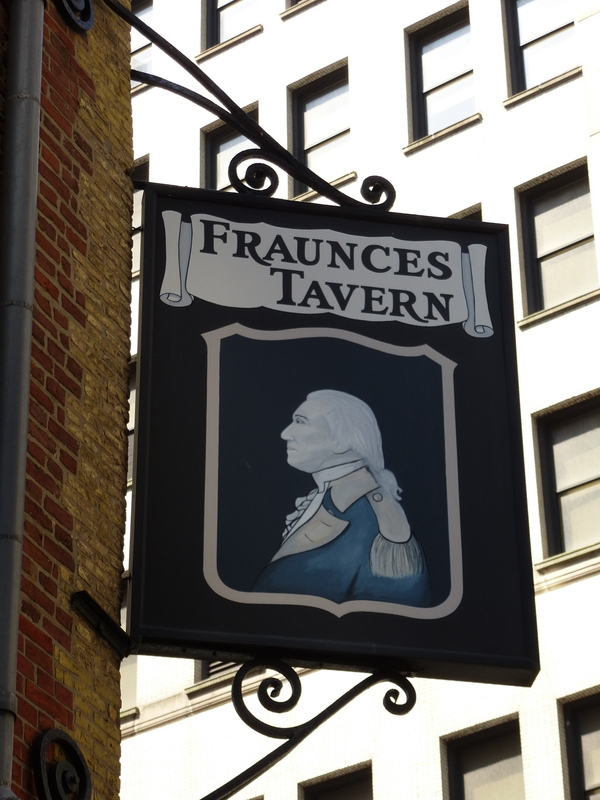 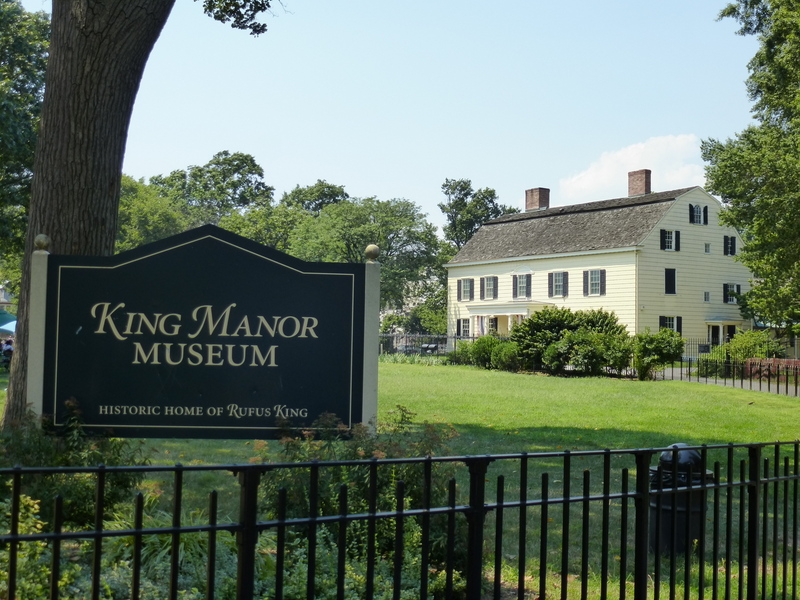 These houses, much like these two Founders, are not as well known as some of the bigger names and not too frequently visited, as a result. 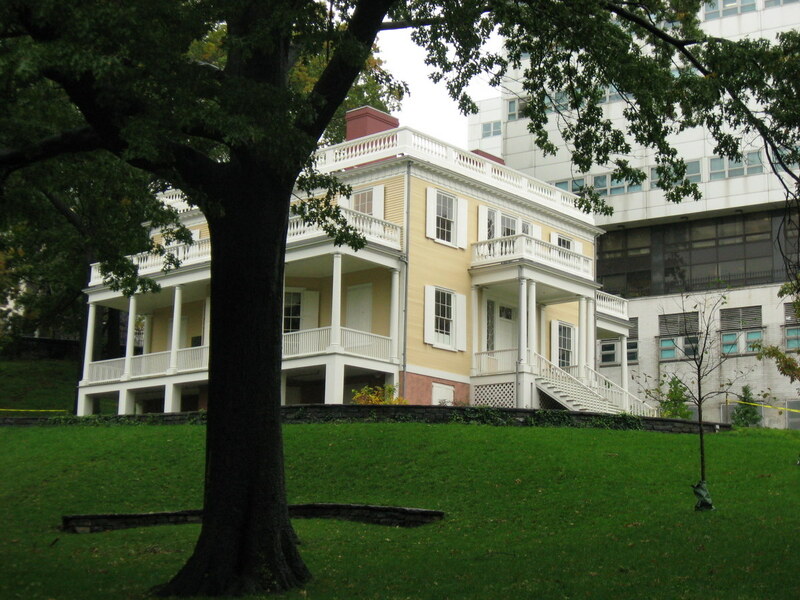 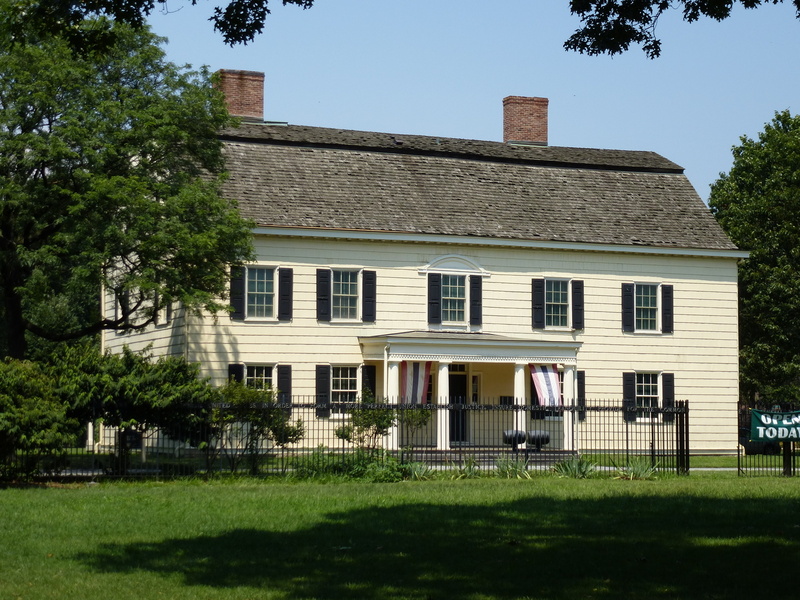 John Jay, one of the authors of the Federalist Papers and negotiator of the controversial Jay Treaty, lived up in Westchester after his retirement from politics. 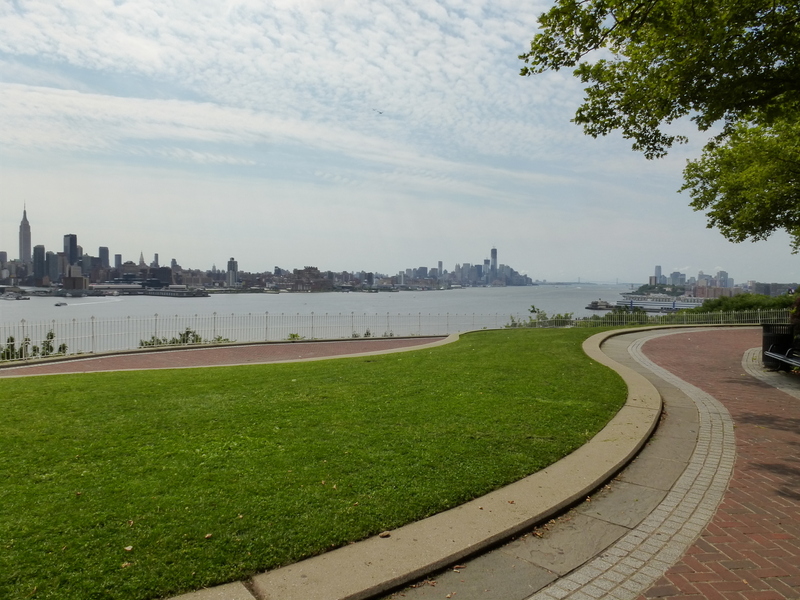 My friend and I were the only visitors there. 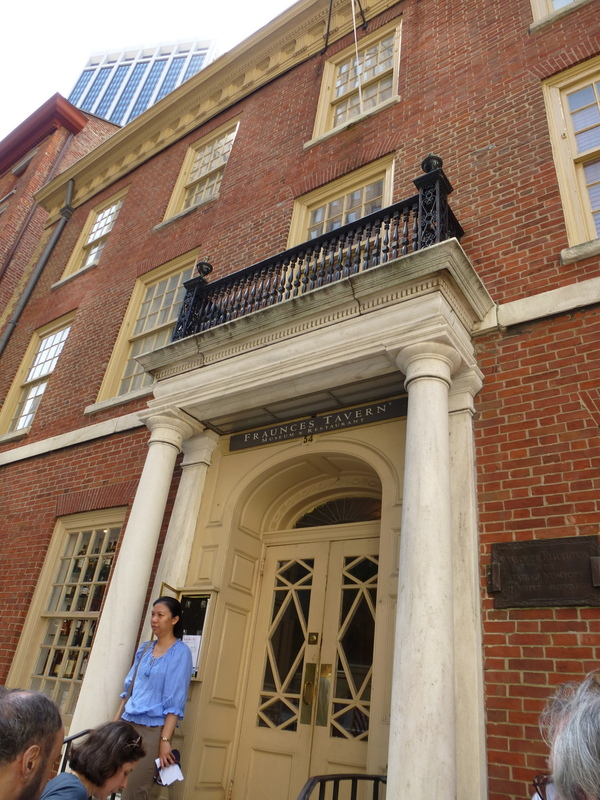 We were told by the tour guide and curator (two different people working there) that they only have a few visitors each day. 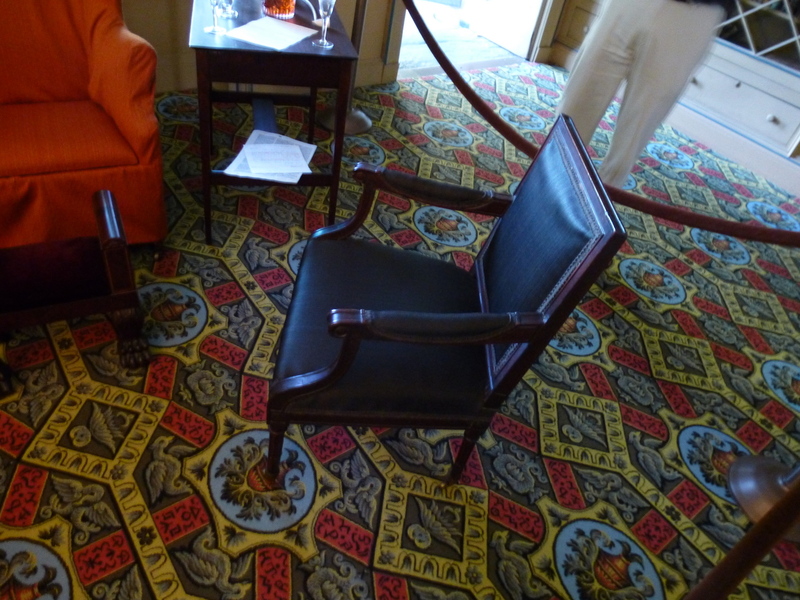 The chairs seen in the above photo and below are not just any ordinary old chairs. 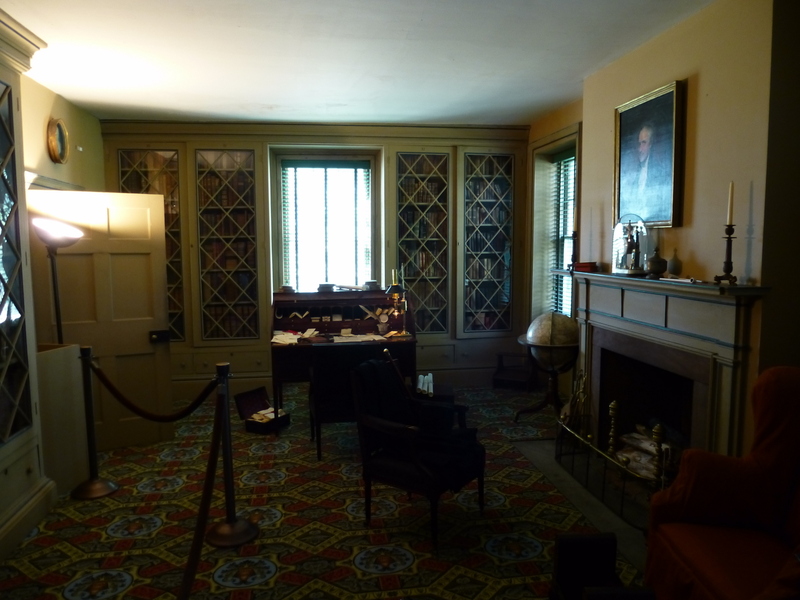 These are three of the original twenty-six chairs from the original Senate chamber when the capital was in New York City. 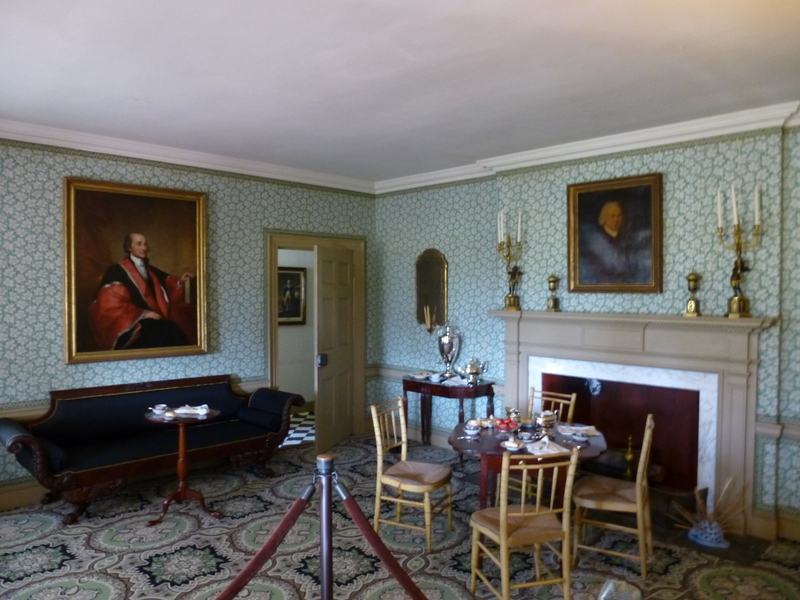 When the chairs were shipped to Washington, D.C., three of them were “accidentally” sent to John Jay. 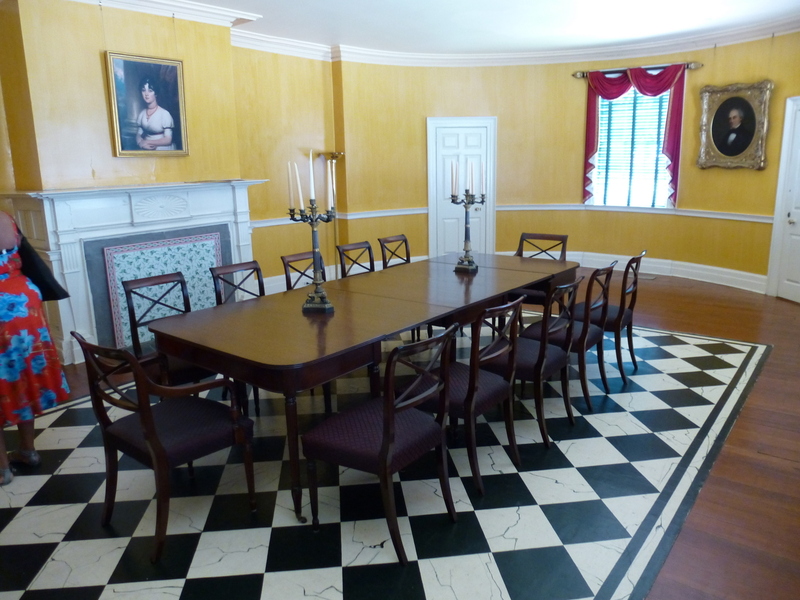 I could not figure out how these chairs were sent to the wrong place or why Jay kept them, but these are certainly pieces of history. 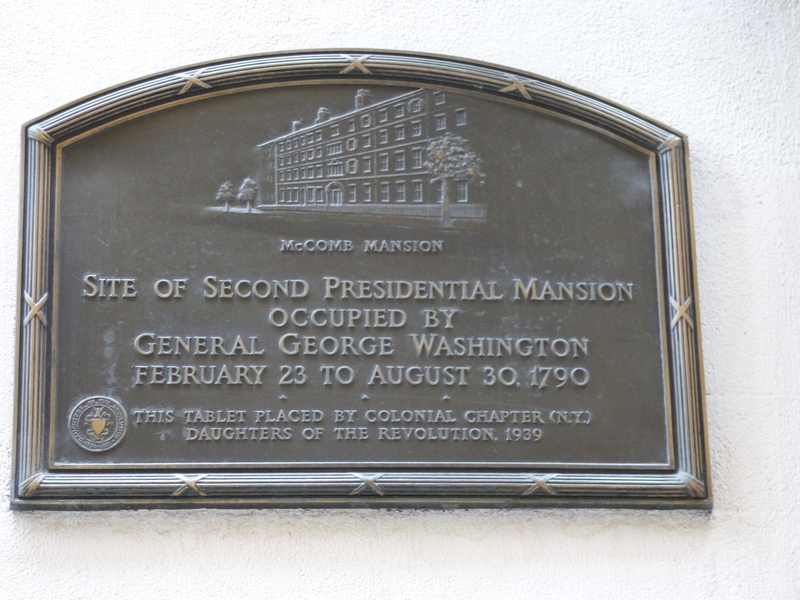 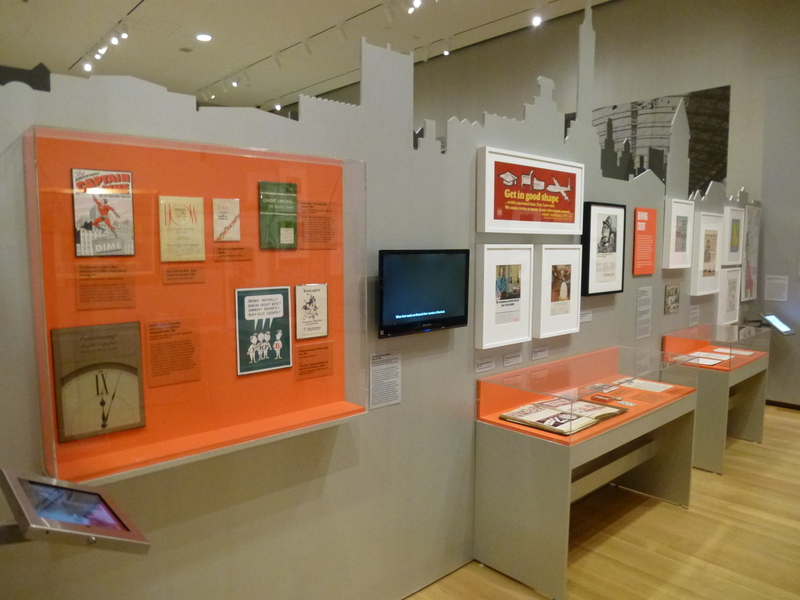 But to the Jay grandchildren, these were not important pieces of history. 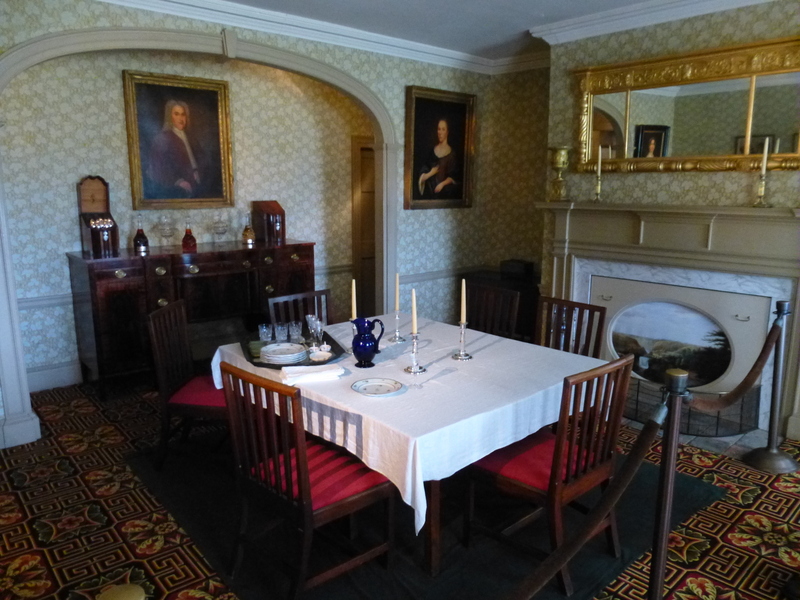 It’s hard to see in the picture, but these chairs have wheels and made perfect engines for racing down the hallway. 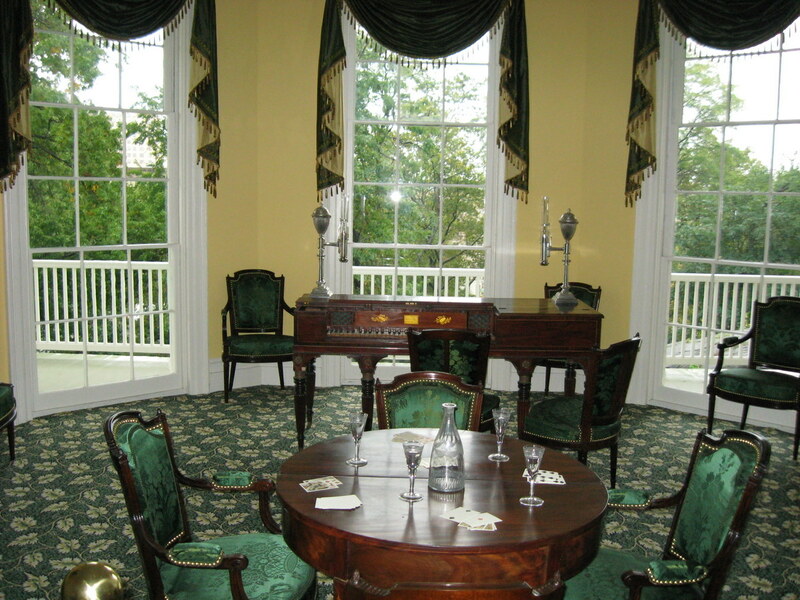 It is amazing that the chairs are still in such great condition. 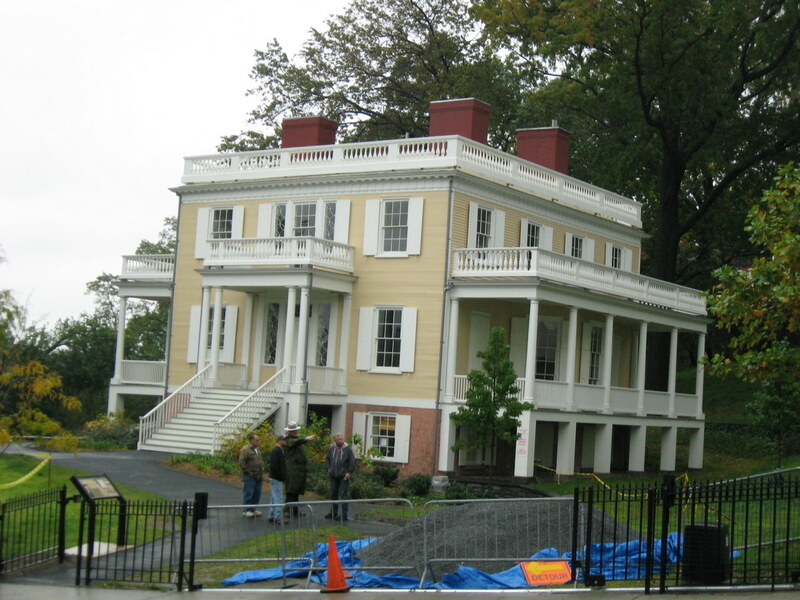 On my recent trip to New York, I had the pleasure of visiting Hamilton Grange, the Harlem house built by Alexander Hamilton in 1802. 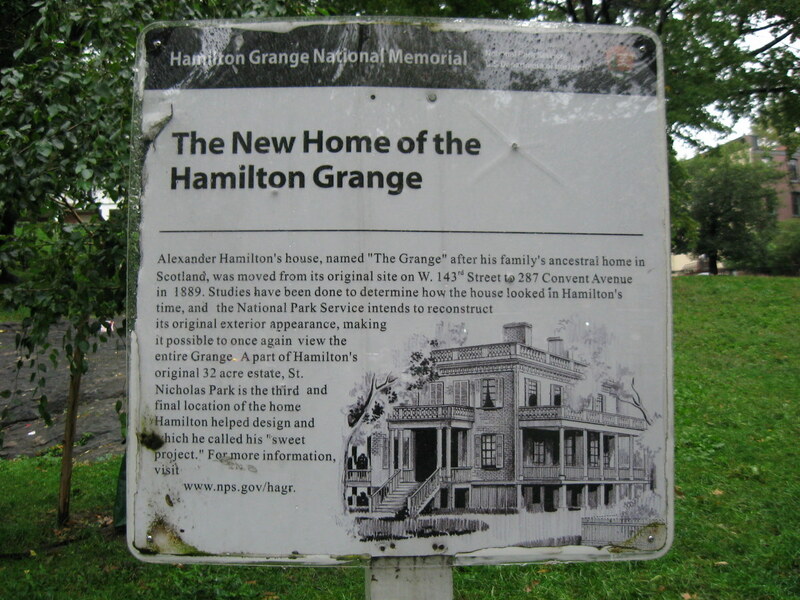 I had visited the Grange before when it was located just a block away tucked in behind a church. 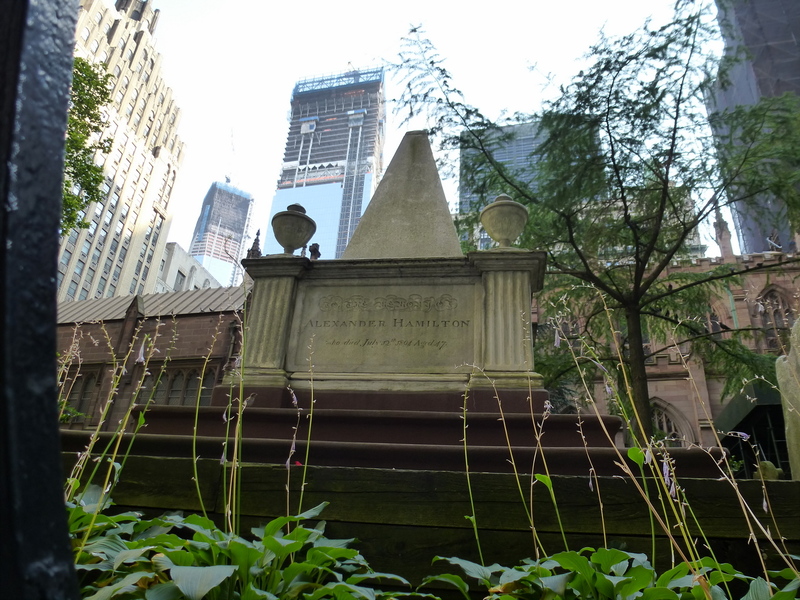 It now sits in St. Nicholas Park, where its beauty shines. 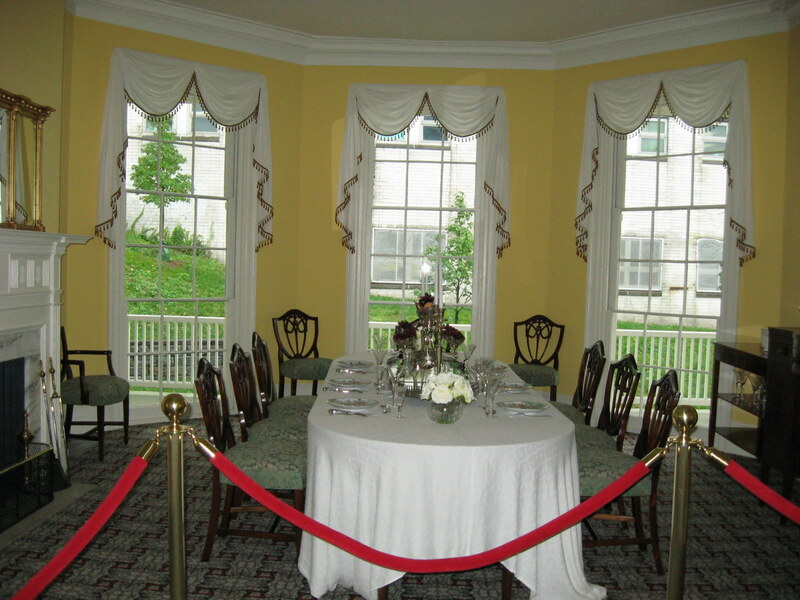 In its new location, the inside of the Grange also looks much brighter and more colorful. 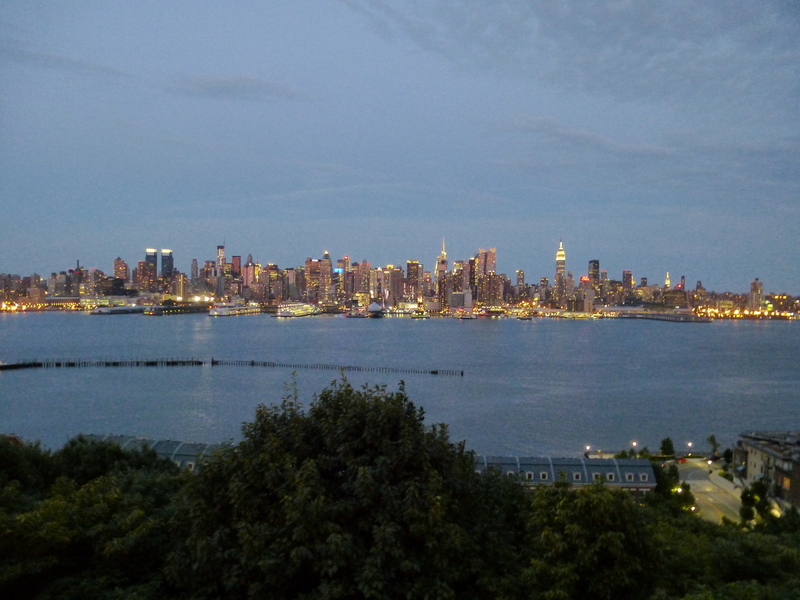 The windows sport better views. 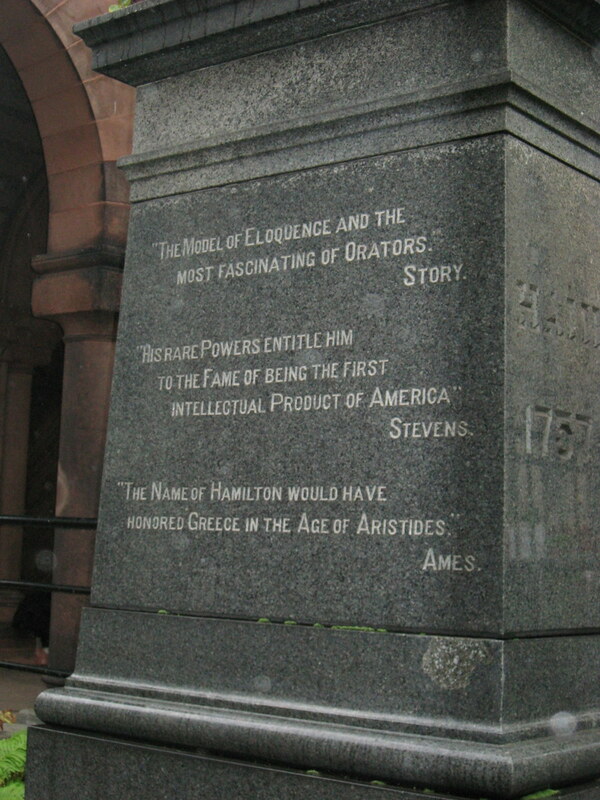 A statue of Alexander Hamilton with some quotes about his greatness still stands at the location where the Grange had previously stood. 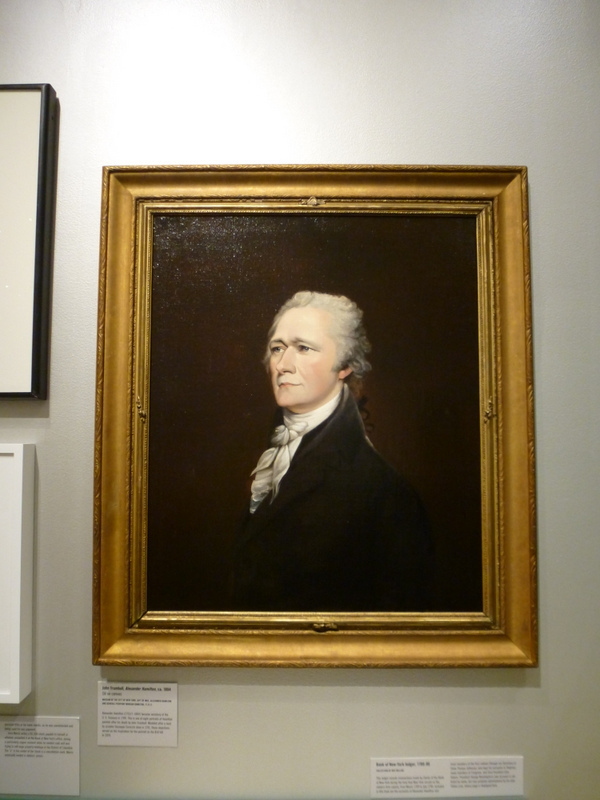 I highly recommend a visit to Hamilton Grange if you live in New York City or planning a visit.